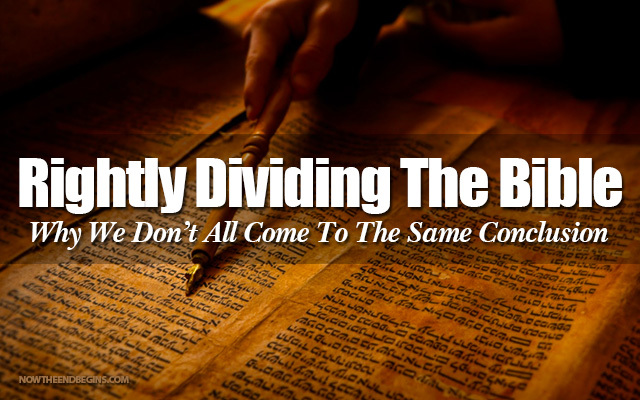 Throughout this article, I make a case that God is fulfilling His Scriptures within a timeframe of 12,000 years of biblical history before the coming millennium of the King Messiah- before the establishment of His righteous reign over all nations. The first 6,000 of these years I take from the six days of the creation account, using the Key of Knowledge: Aleph (i.e., 1 becomes 1,000). Not only did Moses (who wrote Genesis) reveal this creation key, but he did so in a prophetic prayer about the “return” of the LORD (see Ps. 90). Moses guides Bible readers to remember the ancient boundaries of time that God placed on the nations, according to the number of the children of Israel (or twelve sons of Jacob) in Deut. 32, and he compared our works and days to God’s greater creation works and days. Therefore, to strengthen the premise of the six creation days prophetically revealing six millennial days (see Prophetic Genesis Theory) after Adam (created at the end of the 6th day), it must be questioned what empirical value the original six days of Divine works have in a literal timeframe of a renewed creation with replenished life that began in the biblical region of Eden almost 12,000 ago, which the latter symbolism and theory can mirror. Again, in this theory I merely reestablish a biblical fact that our days and Sabbaths serve as shadows of God’s. Paul wrote (cf. Col. 2:16; Ps. 90) that the weekly Sabbath, new moon, and holy moedim feasts are “shadows of things to come.” So why should Bible-believers continue to insist that the six days of Genesis creation and Sabbath were merely our days and not the Creator’s much greater days, especially considering that Adam and Eve did not enter the biblical picture until the end of His creation/restoration (i.e., end of 6th day)? What is the reasoning behind religionists resisting plain, biblical truths on Divine time? And if theologians do so thinking that they are somehow protecting sacred Doctrines, would- if they are found wrong- their shielding for young-Earth creationism not reversely serve as a veil that prevents greater knowledge from being discerned? Can well-meaning exegetes of religion hinder biblical truths as much as the secular world does? Until recent years, mainstream Christian denominations uniformly shunned speculation and prophesying on the time of Christ’s return, scrutinizing even biblical scholars who utilize biblical patterns of time to make their assertions and promote their theories. Too many would-be prophets have “cried wolf” about the time of His arrival and the timing of the Apocalypse, which led people astray and even ruined many believers’ reputations and lives. However sensible it may be, this taboo defies biblical instructions. We are called to consider the former ages and the years of many generations (see Deut. 32:7), and to perceive that our days and Sabbaths serve as witnessing shadows or foreshadowing similitudes of God’s greater/panoramic appointed times. Another reason why many Bible-believers will not heed truths of God’s days being longer than ours is because too many shepherds, posing as beacons of enlightenment, have led them down wrong exegetical pathways. The great philosopher Augustine argued for six mortal days of the Genesis creation, sixteen hundred years ago, which essentially ended Christian arguments for longer creation days. And latter priests and philosophers were not so open to debates by Christian outsiders who challenged Roman Catholic cosmology and biblical eschatology; for them these debates were quiet, internal matters of discussion, for the great philosopher had settled it in their minds. Indeed, individuals were discouraged, sometimes violently, from promoting alternative interpretations of biblical creation and how it correlates with our historical workweek and the coming Sabbath millennium of Messiah. Many preachers, much like Luther was, find it impossible to express that they do not comprehend some biblical things; and they find it difficult to encourage others to seek better understanding elsewhere. Rather, they scold those who question difficult passages (and simple passages) that may conceal greater meaning. It is only important and warrants a deeper investigation if they decide it is; otherwise, do not question how it may be possible, but leave it alone as ultra-literal. Luther was a former Catholic priest following a tradition of church scholars interpreting Scriptures and deciding what was true and what was heretical. While he challenged doctrines of the papal hierarchy, he found it difficult to permit challenges to his own. Thus, even reasoning became an enemy when it was not his own reasoning, which led those following in his footsteps down a path of doctrinal obstinacy and religious pride. Scriptures should be meditated upon and searched back and forth for better understanding, with our reasoning over how it correlates to the world that God created. We are to “study to show ourselves approved,” which means much more than mere memorization of biblical virtues and contents, but contemplation of things written therein. The implication from the passage above is that the other deities, if true, should be able to prove that they created the world, and their creation beginnings should foretell their creation ends, as does God’s. We should always reason and challenge our own presumptions, and feast on fresh manna of substantive truths, and then we can know the end from the beginning. We should not have faith despite reasoning but faith via higher reasoning and learning. Otherwise, we have no greater witness than pagans. We Bible-believers have plenty of room left over for “blind faith” in miracles that we cannot currently comprehend or scientifically explain, but even those miracles are believed by reasonable people because they serve as mere window dressing within a House that has a solid, historical foundation and framework. Also, we perceive that miracles were professed by people who revered God, desired truth, and sought justice (i.e., not worldly appeasers seeking fame and financial gain). God, for us, is the Truth, and He compels us to love all truths despite our natural inclinations, and with His fiery refinement our hearts and minds can recognize them. Thus, Apostle James said, “Faith without works is dead.” The historical works of God are granted us for our reasonable faiths, not merely as metaphysical assertions that are blindly believed. We have faith in things we do not currently understand because of that in which we already do. A preacher is expected to have unrelenting faith and to preach fiery sermons against those who callously reject God’s Holy Word, but the preacher becomes a hypocrite when he or she bars the door on contemplating Scriptures with reason and natural facts, discouraging other believers from doing earnest research. The faithful people of Scripture (e.g., Moses, David) did not discourage deeper search of the Word or reject questioning; they encouraged believers to seek God’s days, His ways, His mysteries, and all His declared truths. “Inform of the former days,” the patriarch Moses instructed in Deuteronomy. Those who truly believe in God’s Word have no fear of others investigating the deep and mysterious things of Scripture. Moreover, it is one thing to be zealous because people refuse to consider greater truths, and it is another to get angry at people who are trying to perceive how greater truths fit together. One is a revealer of light and the other a veil of prideful religion. One has the faith-filled intention of provoking others to do a deeper search of the Word and the other discourages it. It was right for Luther to battle those who persuaded others to doubt Scriptures, but it was detrimental to the faith for him to make reason itself an enemy of biblical faith, as if the natural world was not methodologically created by our brilliant God. Thus, true reasoning is never a “whore” or unfaithful, but only faulty reasoning that hastily concludes against God without sufficient comprehension of the things in which we reason over. In making reasonable correlations of the six millennial days of the renewal to scientific discovery, know that scriptural precedence is set that God did not make a “full end” when describing Judah’s punishment as a dark, formless void and unmanned earth (read introduction to New Genesis Theory). Neither is the Apocalypse a full end, rather it is a renewal soon to come. Hence, we must only describe a cataclysmic event that occurred before 12,000 years ago, whereby there was a need, within the biblical creation timeframe, for replenishing the world with more animals, vegetation, marine life, and for bringing the world, or even a specific region such as Mesopotamia, out of darkness (i.e., restoration from a former epoch). This event is not too difficult to find. 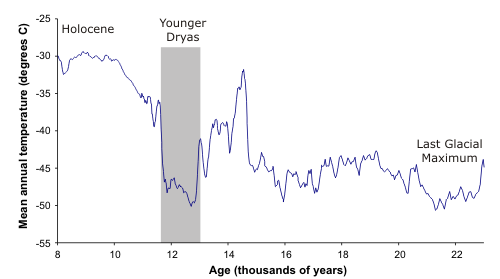 Reportedly, after the last Glacial Maximus (25,000-15,000 ka), the world experienced the last plunge of the great glacial age known as the Younger Dryas, circa 12,900 years ago. This event is usually posited to have lasted somewhere around 1,000 years. During this time great glaciers covered much of the northern hemisphere, from North America to Europe to northern Russia, blanketing much of the scarcely populated planet in a void sheet of ice, with detrimental effects for the entire biosphere. Ice ages are not unusual for the world, and some evidences suggest that much of what are today near-tropical regions were once covered with ice and/or slush before the Cambrian era. Sedimentary evidences of glacial dropstones found in the Namibian desert by geologist Paul Hoffman, following the works of Joseph Kirschvink from the California Institute of Technology, seem to support a short time when the world was mostly frozen- long before us- or what Kirschvink called the “Snowball Earth Theory.” (See also the works of Louis Agassiz.) And while scientists disagree over the extent of the ancient freeze, few disagree with the conclusion that abundant life appeared (was created) after the so-called “Infra-Cambrian Glaciation” period. 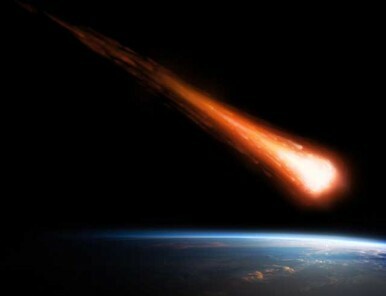 Evidences, such as innumerable spherules found at Clovis sites, were left by comet or meteorite impacts as fire rained down from the heavens above. Ancient settlements were blanketed with them, whereas beneath them a different story is told, confessing that the impact is what instantly destroyed many ancients. Nevertheless, whether the Y.D. Impact Hypothesis offers the correct cause of the catastrophic results, as I have come to agree with, or another cataclysmic event caused so many extinctions, what most concerns this work is that the world recently experienced a mini apocalypse, and it emerged from the dark period during the same millennial day that the Lord began His restorative works in Mesopotamia, as recorded in the Genesis recreation summary. “The so-called extra-terrestrial impact hypothesis adds to the mystery of what happened at the YDB with its sudden and unexplained reversion to an ice age climate, the rapid and seemingly simultaneous loss of many Pleistocene animals, such as mammoths and mastodons, as well as the demise of what archaeologists call the Clovis culture.”- Al Goodyear, Conductor of Research through Institute of Anthropology and Archaeology at U.S.C. The ever-emerging facts of the Pleistocene Extinction serve as nightmarish spanking for many reluctant scientists of uniformitarianism, given by the strong hand of support for global catastrophism. Evidences for global tidal waves that left thousands of miles of animal carcasses- possibly millions of them- jumbled and entangled in vegetation, instantly tossed and frozen with tropical vegetation still in their mouths, leave little support for the gradualism of encroaching glaciers. Whole cultures were completely wiped-out of existence during this time, as mentioned of the Clovis Culture of paleo-America and early Egyptian harvesters. Estimates of animal extinctions oftentimes range from 30 to 40 species in North America to hundreds around the world, with perhaps up to 80% of the then-extant megafauna wiped-out in particularly hard-struck regions. Even vegetation and forestry (e.g., some flower species and an ancient Spruce) are now known to be forever gone as a result. Darwin, the hero of godless materialism, thought it was so great as to have shaken “the entire framework of the globe.” He thought, as far back as the mid-1800s, that “the extinction of species has been involved in the most gratuitous mystery.” I only include his opinion so that it can hardly be presumed that these conclusions of calamity are correlated to Scriptures with bias against evolution. Many scientists, besides strict uniformitarians, have honestly acknowledged how extreme this event was in the recent past, and speculations and theories continue. Gradualism, though having a minor part in the world cataclysm, is not what the natural facts hint at; they scream of a sudden punishment from the heavens over 12,000 years ago. Uniformitarian theorists cling to their theory of the last glacial age’s meltwaters cooling the North Atlantic Ocean and causing the Younger Dryas, which is simply obstinacy towards the many revealed facts. Flood water flowing down the Mackenzie Valley to cause this is a ridiculous answer for explaining what was apparently a swift, global catastrophe, as are all theories of a stalled Atlantic conveyor system causing such rapid calamity. Some researchers consider this event, almost 13,000 years ago, to be as great as the cataclysm that wiped-out the dinosaurs (est. 65 Ma), and a few speculate that it may have been even more catastrophic. Evidences have been found for supercharged dust/windstorms that carried sweeping fires across the North American continent; earthquakes from one end of the globe to another; resulting sea levels rising up to 400 feet by melted glaciers; and pitch darkness by atmospheric debris that blocked out the noonday sun. Nano-diamonds/fullerites (or fullerenes) found in abundance at the Clovis sights and elsewhere on the globe are strong evidences of an extraterrestrial impact causing this pre-12,000 ka apocalypse. A sediment layer called the “black mat”- of charred earth and animal remains- appears to blanket much of the ancient world for the period, particularly the northern hemisphere; yet evidence of the impact extends into South America and beyond Europe into the Middle East. Such evidences for these great fires from heaven have also been found by Earth Scientist James Kenneth at the Euphrates Valley. Euphrates is one of the four rivers which joined at the Garden of Eden. One of the same rivers that flowed down through southern Mesopotamia and out to the sea was affected by this punishment of fire from heaven- the area later renewed as paradise. To understand how much this event had a large effect on human lives, we need only understand human population growth rates and how few people were left in the proto-historic world after it occurred. With generous population estimations, there were less than two million people roaming the ancient world around 12,000 years ago, but more likely estimations place the number of humans somewhere far below one million. Though these numbers become more speculative the further they descend before our Common Era, the basic premise is that it took less than 12,000 years for the population of Homo sapiens to grow from around 1 million people to over 7 billion people in today’s world. Thus, for almost the entire supposed age of modern humans, be it asserted to have begun 500,000 ka or more recently around 200,000 ka, humans, according to many statisticians, have hovered somewhere below 1 million people on ancient Earth. We may descend even further back if the controversial subject of the Neanderthal people was finally settled- ordinary humans who reproduced with us so-called Homo sapiens, now known to have but a few ever-so-slight genetic dissimilarities. In other words, people have been around for a long time according to contemporary sciences. Indeed, some scientists assert that Homo sapiens (humans) date as far back as 2,000,000 Ma. But whatever evolutionists (which I am not) may today consider modern humans (i.e., after the postured Homo erectus), human beings began an unprecedented breeding frenzy that began less than a dozen millenniums ago. At 500,000 years of humanity, this population growth can be compared to a slightly-widening tree trunk reaching a height of over 95 miles- above the Karman line of Earth’s atmosphere- then all of its major horizontal branches shooting-out abruptly at the top 2 miles (12,000 yrs.). Even at 40 miles high the population discrepancy is striking. A long-hovering one million or less people on Earth may sound like a large number to some readers, but consider that today Tokyo city alone has over 32 million people, and almost the entire population is the result of reproduction in the past millennium. So what truly caused such a gigantic leap in population in such a short timespan- within the supposed long Homo sapiens age? And could evolutionists’ long age of humanity confess irreconcilable problems with population growth figures? Even with global catastrophes every 20,000 years and long ice ages, it is highly improbable that humans like us would not have increased to fully populated the world at least once before, within such a lengthy timeframe of indistinguishable intelligences and near-indistinguishable physical statures. This truth necessitates only common sense for reasonable thinkers. Hunter-gatherer, nomadic tribes with lower lifespans is a ridiculous excuse for the discrepancies between an ancient 500,000-200,000 year-old age of Homo sapiens and conflicting world population growth facts and estimations, especially since many evolutionists posture that early females reproduced as young as ten years of age to help justify their great, unproven evolutionary leaps, like the bigger-than-chimp brains of humankind. The nature of humanity is to breed abundantly and quickly, which is a given, but there is no mathematical formula or computer model which can easily dismiss the common sense conclusion that humans virtually indistinguishable from ourselves could hardly have lived on this planet for more than 50,000 years without fully populating the world at least once before us in pre-history- without the YD cataclysm almost wiping-out humanity, along with several great cataclysms before it. Imagine if something destroyed all life on the planet today, save but a small family or two who became hunters and nomads, and they lost all knowledge of history yet maintained their mental capacities and physiological uniqueness. Give the saved humans about 15,000 years, which is far, far more than population facts and data show that they would need to repopulate the world to the over 7 billion of today, and let them begin investigating below the topsoil. The newly relearning world would be awestruck by their finds and quickly realize that another astonishing world population of cultures had once existed, with more ancient ruins than could be investigated for millennia. Yet after over a century of archaeological excavations, we know that nothing similar to our world has ever existed, not within 50,000, 250,000, or even 500,000 years. Half a million years of roaming Homo sapiens, or hominids so indistinguishable from us, has granted us an ancient world of virtual silence, be it we seek great things in ice or in Africa. Even the Homo robustus hominid of their evolutionary dreams could have accomplished much more than the earthly record indicates. Ancient settlements are all fairly recent, and we know that the population of mankind has never reached anything close to what we have factually accomplished since the age of Adam, in so short a time, and the blooming of our inventions is completely new to the world record, leaving no viable naturalist explanation. Perceiving this anomaly sheds new light on God’s command for Adam and Eve to “be fruitful and multiply” and “have dominion” over the earth. With the 250,000 to 200,000 years that most evolutionists today allow the Homo sapiens age (such numbers seem to shrink and grow), the world should have been populated many times, more like us, filling the anemic proto-historical record, not reveal that people scarcely populated the world for so long. Again, history proves how quickly we reproduce. According to population growth rates, we could have peopled the world as today’s population in only a few thousand years, at least under more favorable conditions. Humans have the potential of doing so in less than 4,000 years, which fits nicely with the Great Deluge models. Yet the planet’s archaeological record does not grant us a vast junkyard of ancient cities and settlements to the measure that we should expect for so much time of mankind breeding on Earth. For paleoanthropologists to lightly explain our ancestors without Divine intervention, as ignorant hominid herds, lacks biological support due to the paucity of genetic differences. Even Neanderthals have recently been reinterpreted, whereby they were not ignorant beasts, as was long posited by devout neo-Darwinists to support their paradigm of gradual human evolution. And several evolutionists consider our recent relatives completely, or at least virtually, indistinguishable from modern humans, much as evolutionists Donald Johanson and Maitland Eddy explained decades ago in reinterpreting of Cro-Magnons in Lucy. There is a gigantic canyon between evolutionists’ interpretations of human bones and actual, verifiable ancient settlements and communities. Devout evolutionists will often interpret cave paintings and assign millions of years to the flimsiest of artifacts, but a solid view of humanity has to deal with much more recent dates and sure evidences. Almost all notable sites of early settlements are credibly dated at less than 12,000 years old, beginning with the recently discovered Golbekli Tepe c. 11,700 BP. The great bulk of which are found in the ruins of the Middle and Near East. Northern Africa, Mesopotamia, and Western Asia (Turkish region) are included here in this Cradle of Civilization. I use the term “civilization” in the sense of building projects and notable populaces in communities that expressed inventiveness and progressive intelligence- i.e., not disputable cave drawings and embellishments of insignificant, questionable relics. Historians place Sumer- the earliest proto-Euphrateans community and first great city-state civilization- after 4,000 BC, which follows the time and region of the Genesis record of Eden. Even communities said to be of the Cradle of Agriculture are also in the Middle East, estimated to have begun around 12,500 years ago. Thus, it is difficult for a reasonable mind to justify such a lengthy time for stunted human population growth and humanity’s complete lack of cultural and civilization achievements, at least concerning roaming Homo sapiens with natures, intellects, abilities, and physiques virtually indistinguishable from our own. What is perceived from all over the ancestral world is virtual silence until around 12,000 ka, followed by very modest growth in primitive civilizations and agriculture (Mesolithic Era), and finally an explosion of population and intelligence in southern Mesopotamia from about 4000 BC (Neolithic). Before 12,000 ka we have such menial crumbs of evidence that it begs us to believe that something truly horrific happened to earlier peoples- so much so that the biblical assertion that “There is no memory of them” fits nicely. It is an inherent part of human nature to gather into communities for better protection of offspring, to quickly invent and advance, to build, and to have more children in the most adverse times. The answers given to lend credence to an ancient, evolving humankind do not suffice for the facts which we now know to be true: The crust of the earth more readily reveals a much younger history of human civilization than the currently prevailing theories of Homo sapiens suggest. What the clear facts hint to is a world cataclysm before 12,000 ka and a Divine transformation of the nature of humankind during the timeframe of Adam and Eve in southern Mesopotamia. Gradualists completely ignore the true nature of mankind in ambition and growth, and I think intuitively they must realize this. WW II; WW I; American Civil War; Mongolian Conquest Wars; Spanish-American War; Sino-Japanese War; White Lotus Rebellion; Red Eyebrows; Quing Dynasty Conquest; American revolution; Taiping Rebellion; Lushan Rebellion; Dungan Revolt; Reconquista War; Russian Civil War; Three Kingdom Wars; Napoleonic Wars; 30 Years’ War; Hundred Years’ War; Huguenot War; French Religious Wars; Great War of Africa; etc. This article could not contain all the wars and conflicts that have taken place in but a few millenniums. Despite all the raging plagues and pandemics and our advance in the art of war- with great devises invented for killing others, including weapons of mass destruction- humankind has quickly ballooned and filled the entire planet, providing undeniable evidence of our resilience and determination to rapidly increase our kind, even against extreme factors. Think of all the evils that have occurred on Earth in the last few thousand years, and consider if ice-fishing, tribal warring and hunting difficulties could have truly hindered humans from attaining global dominance for hundreds of thousands of years. Without several world cataclysms and a significant transformation in human reproduction since the age of Adam, it is difficult to imagine that the problems faced ancient humans would so exceed our own that they failed to do more than scarcely populate Earth for hundreds of thousands of years, leaving us relatively little to study. Our past few millenniums are not the exception to the rule of life, if God played no role in humanity, but is the rule which should set the premises and standards of theories which seek to explain ancient humanity. Why? General conclusions of the undocumented and unobserved past should reasonably resemble our observed and documented history and science. Instead, we have contradicting postulations of 500,000-200,000 years of a virtually sterile mankind and piecemeal theories of arrowheads, cave drawings, and gradually evolving mankind. Sluggish humankind roaming the ancient earth for hundreds of thousands of years and accomplishing so little would not be like us. Humans would have populated the world at least a few times before even if it meant that we were forced to make a global economy of domesticating polar bears and arctic seals, with ice fishing supplementing the icicles industry in our intertribal trade. Ambition, will, imagination, building, and inventiveness of humans are practically boundless, and we breed more under harsh conditions and duress. The nature of humans- how quickly we learn, reproduce, invent, and build- was completely, factually transformed less than 6,000 years ago, with intelligent beings thirsty for knowledge and power over nature. This is in such a minute span of time in evolutionary terms that it necessitates either superior extraterrestrial enhancement of our genes, unsupported by genetic research, or God’s intervention to change our spiritual nature. There are no substantial physiological changes to support a great leap in human evolution, to account for our population growth rate and striving intelligence, only an otherwise unexplained enlightenment- an enigma. If we fairly consider the facts, the failed Theory of Evolution has nothing to bring to the table. Evolutionists continue to argue over what spurned this explosion of modern humanity, be it credited to language, agriculture, religion, etc., but we know that God created the new man in His image. Once again, consider the problems with gradualism: They basically ask us to believe that Homo sapiens, not so different from us, walked an almost flat horizontal line for hundreds of thousands of years, hovering below one million people scarcely spread across the globe, apparently lacking all ambition for community growth, and then our numbers shot straight through the roof within a twelve thousand year timeframe, and the great bulk of population growth in less than four thousand years, increasing with our knowledge and ambition. According to them, earlier human reasoning and abilities were virtually indistinguishable from our own; yet they utterly failed in hundreds of thousands of years to compare to what we have factually achieved in a few thousand. The Bible’s account of mankind can be compared to a six-layer cake displayed on a large table, only the cake is shaped like an upright funnel. Everything which came before the great cake is like a few dozen crumbs scarcely spread around. Many Christians insist that the world is as only as old as the cake, and that the crumbs which look like they are further away- from distant times- simply crumbled off at the base layer/period of the cake- around the time of Adam. Evolutionists who propose gradualism would confer that the many crumbs came together and formed the cake, with the first layer not being substantially greater than the surrounding crumbs. However, in the real time that it took for the baker to bake the layers of the cake, in view of gradualism, the crumbs that sat on the table all day long should have arisen to make multiple cakes, similar to the one cake that we know to exist as our recent human civilizations. Clearly what should be a large bakery display is missing all but one of its cakes for the amount of time the baker has been given to bake them. If one cake can be baked in an hour, and a security camera reveals that no other cakes were ever on the table, the crumbs left all night and all day long can hardly be the origin of the quickly baked cake. Although we who are called “old-Earth creationists” heed the crumbs as older than the cake we have today, we perceive that the young-Earth creation model of mankind is much closer to human truths than evolution gradualism, for the Theory of Evolution leaves more to be desired of the cultural crumbs that they enthusiastically embrace. Thus, it is absolutely deceiving for devout evolutionists to present world history in a false light of a gradual evolution of mankind, failing to acknowledge that the great growth in human population and our achievements correlates beautifully with facts from the Bible. Crumbs scattered in a season of nights cannot truly delight as this large cake so brightly displayed but for an hour of our new global life. Nothing like our short age has ever happened before, at least not according to archaeological finds and sound scientific data, and there solutions for this do not suffice. I propose that the civilization crumbs left us are from a few smaller cupcakes that were eaten over 12,000 years ago, and almost 6,000 years ago the first new layer of a much larger, tastier cake was set on the table. Adam and Eve began this new, richer cake. Some of the crumbs of former cupcakes managed to survive without being eaten and they surrounded the new layer, but their existence does not diminish the great new works of God that began in southern Mesopotamia c. 4000 BC. If truly anything larger than the cupcakes existed pre-12,000 ka, they must lie hidden at the bottom of the ocean or far beneath arctic ice. Perhaps a hidden history may someday come to light. But if they are not forgotten beneath the glacial ice or buried on the ocean floor, such a great discrepancy cannot be easily reasoned-away to support a gradual evolutionary model. If people actually began making paint pigments 200,000 years ago, and needles in paleo-Russia 30,000 years ago, how could they so utterly fail to use their inventiveness to do more over such a vast expanse of time? Thus, I am not suggesting that the world is not billions of years old, or that species were not created long before us; I am simply saying, “Lucy, we have a problem!” Written language, population growth, complicated crafts, inventiveness, metallurgy, governance, astronomy, mathematics, primitive architecture, agricultural development, animal domestication, religion, and almost every single thing we take for granted that helps us fingerprint humanity emerged entirely or predominately from the biblical time and region disclosed in Genesis. These are clear facts of history, not theoretical interpretations. Everything before this region and time are like comparing crumbs to a great cake- like mist to a tsunami that began roaring in c. 4000 BC. Something is missing from the big picture, and the Theory of Evolution only serves to further obscure it. Everything fits for a new beginning correlating to Scripture. I emphasize these things because they are ridiculously minimized by devout evolutionists. Imagine a great banquet hosted at a lavish convention center, with tables furnished with every sort of exotic fruit, in an inviting environment showcasing a plush interior habitat of jungle décor, beautifully arrayed from polished rock floors to vaulted ceilings with picturesque, gracious green scenery. Then a few ushers arrive and begin seating a rowdy crowd of 100 monkeys from an adjoining hall. This is their party; this is their paradise. More attendants arrive and more monkeys are seated quicker (though they rage and won’t sit still in their seats). Suppose the total time that it took to bring in the 100 monkeys (filling the room) and for them to enjoy the catering, causing a horrific mess, was less than half an hour. Then the chastising monkey-tender rebuttals with Freudian smugness: “They were coming in at a much, much slower rate earlier, and they didn’t touch much, and others were leaving almost as quickly as those coming in! So you are still late and still don’t know what you’re talking about!” And not being satisfied with chastising her, the monkey-tender proceeds in his rounds to tell other employees how ignorant the new attendant is. Thus, either the monkeys’ nature drastically changed in the very last half-hour or the entire story of the ten hours of catering was fabricated. However, what can be eliminated from consideration is the consistency of the monkeys filling the room and leaving a horrific mess. The longer timeframe does not match the multiplication of moneys and lack of mess. An alternative would be that something terrible had wiped-out almost all of the monkeys before the last half-hour, and every twenty minutes or so before that for the said ten hours, and the new attendant, seeing only a few monkeys and untouched foods, was witnessing a new beginning of the monkeys. Likewise, something so terrible would have had to occur at least every five to ten thousand years to diminish human population growth and thriving communities for hundreds of thousands of years, at least if we took seriously evolutionists’ claims of gradual, hominid evolution. And I am not promoting that humans share a common ancestor with monkeys or chimps 5-2 million years ago, but I was only using an analogy that even evolutionists might comprehend. Evolutionists claim that mankind was hunting game in Africa for at least 150,000 years, but their wild stories of ancient humans do not mesh with the abilities and growth of humankind. Besides, unlike the angry monkey attendant, paleoanthropologists were not around to actually observe what happened on ancient Earth; they must reason over the same contradicting clues as those of us who doubt that humans like us could have been so long on the planet. While there are still several very primitive tribes in the world today, their existence is the minority exception to the human rule, not the standard. From Asia to Europe to South America, evidences for human creativity are abundant for the last few millenniums, in largely isolated cultures. There have always been primitive peoples who lack human ambition, retarding their cultural achievements, but not because they lack the intelligence or resources. For most of humanity, Helen Keller, born deaf and blind, exemplifies our intuitiveness and willingness to excel and learn. And to claim that our biological and mental equals 50,000 year ago failed to invent the wheel, which was invented in southern Mesopotamia, is fairly ridiculous. A smart five year old can watch rocks or snowballs roll down a hill and imagine ways of riding them, or stick a stick between two and watch them roll together. I learned to ride down a hill inside a tractor tire as a mischievous child, which of itself implies that I was hardly the brightest kid in town. So, even our youthful stupidity can lead to inventions via the intuitive human mind. We can hardly imagine that an Isaac Newton or an Albert Einstein living between 200,000 ka and 10,000 ka would model gradualism. Indeed, they would have had to been involuntarily silenced by tribal masses with molasses or tree sap shoved down their proverbial pipes, at least to prevent them from teaching ancient discoveries- or duct taped to dumbness in some kind of primitive way. It is extremely difficult for truly reasonable minds to make good sense of our evidentiary past intellectual poverty. Ancients knew how to draw the animals that they observed in nature on caves but somehow failed to invent the simple wheel for hundreds of thousands of years, even with all of nature’s clues? Really? Hence, it is not only the lack of population growth that defies logic when it comes to gradualism, but also an astonishing lack of human accomplishments in so vast a period of time. Adam was given a command to be fruitful and multiply, to replenish the world (see Gen. 1:28), and this shows God’s intervention in the nature of human reproduction. Statistics correlate to this command. He was also made to have dominion over the earth, skies, and seas (see Gen. 1:26); this suggests a new nature of human ambition. Animal domestication during the early Mesopotamian civilization, during the time and place of Adam and Eve, was much more developed than peoples before them. Adam was made a tiller of the soil (see Gen. 2:5, 15), and agricultural advancement is also perceived of this period and region. In Adam and Eve we find several clues of early civilization coming together: 1) faith, communication with God; 2) animals migrating to humankind, domestication; 3) harvesting; 4) command of the seas; 5) increased population growth- to fill or replenish the world; 6) astronomy, seasonal times; and 7) literacy, to record names for all the newly arriving animals after the Holocene Optimum. With the authority that God gave to Adam and Eve, and the biblical clues left about their lives, we perceive people much like ourselves. The Bible lists everything necessary for our species’ enlightenment, where an advanced people began a wholly new and distinctive age. It lists them at the proper place and time, confirmed by archaeological discoveries. What evolutionary ideas fail at miserably for their model of human development, the biblical model has no qualms. Nevertheless, it is not becoming of truth-seekers to blatantly ignore the crumbs which were indeed spread upon the global table, left before the Adamic Enlightenment. Doing so is irresponsible and not inductive to the establishment of truths. It is important for us to discover if Scriptures truly have an error of omission or an error of commission or perhaps even a purposeful hiding of things until an appointed time. The fact is, peoples did exist prior to the time of Adam and Eve, sluggish as they apparently were, and this requires our attention if we are not to sit obstinately in denial. I am not implying that we should be like the evolutionists who dwell over crumbs and practically ignore the first great layer of the cake, but only that we should seek greater comprehension of an ancient world if we are to discern more about God’s works in Genesis. As we look back on prehistoric times, we find that practically all notable communities date back to just before or after 12,000 years ago. These include familiar finds like Tel Qaramel in Syria c. 12,000-9500 ka; Gobekli Tepe in Turkey c. 11,800-11,000 ka; Lahuradewa in India c. 11,000-10,500 ka; ancient Jericho c. 10,400-9,000 ka; Catalhoyuk in Turkey c. 7,500-7,400 ka; and about a dozen others. Plus, we must not forget the indigenous people of the Clovis communities that the Younger Dryas cataclysm annihilated. What is amazing to me is not that ancient peoples existed before the biblical account, but the virtual silence of humanity before an enigmatic explosion of structural communities after the Younger Dryas catastrophe. To appreciate the extraordinary rise of human achievements, we might compare accomplishments before 12,000 years ago and what came afterwards in the Mesolithic Era to Precambrian organisms and then the explosion of Cambrian phyla. Further, we find that Mesolithic settlements compared to city-state civilization in southern Mesopotamia, at the time of Adam, is even more dramatic. In this period we cannot rationalize any sort of gradualistic evolution, but a gigantic leap planned by a purposive God. A fair look at our rise of civilization offers validity to the conclusion that circa 12,000 years ago was an ideal time in proto-history for any true God to have begun His work for human enlightenment- with a beginning boundary for communicating His prophetic objectives. Further, southern Mesopotamia 6,000 years ago is the ideal place in time for a true Creator to disclose an even more profound rise in population and an explosion of human knowledge and accomplishments in city-state civilizations. I have already asserted that Adam and Eve were the reason for our new age, but for us to better understand Scripture we should know what God accomplished in recently restoring the world, leading to the growth of Mesolithic communities and finally to Adam and Eve. Old civilization crumbs support a new beginning after the cataclysmic YDI, but there are more parallels that corroborate with the Genesis account. We will proceed in this theory by sequencing the restorative events in Genesis with corporeal discoveries, and thus debunk the notion of a biblical error of omission in a recent creation. This investigation must consist of six millennial days, since we are only granted a millennial key to form our exegeses. The claim of this work is that God controls nature and moved to restore paradise for a new and better world during this timeframe. Thus, I have kept the sequence of the six days of recreation in Genesis as is so that it plainly parallels scientific findings for the millennial days that it summarizes. This exegesis will offer enough empirical support to establish the basic, millennial framework with clarity and consistency, but it will not be so scientifically detailed with data that the average reader loses interest in the overall theme. Readers who seek more details, facts, and data are encouraged to follow the works of the excellent scientists referenced in this chapter, or to perhaps look to other research sources. The goal of this theory is to make the Genesis account restoratively plain, not to present a solely scientific thesis that bores or burdens readers with complex data. In the first millennial day of the renewal, 12,000-11,000 years ago (10000-9000 BCE; ka also referred to “BP” for “Before Present”), God first cleared the atmosphere, and the sun began to shine. He gave His command, and darkness gave way to light, and days and night were restored to the ancient world. His Spirit hovered gently over the surface of a darkened ocean, possibly covered with volcanic ash and other debris, and He began His restorative works for cultivating the garden region. The renewal of the desolated “earth” referred to in Genesis can be interpreted globally, hemispherical, or even refer to a specific region, as Scripture described of Jerusalem in Judah. I believe some passages of the Lord’s renewal days are indicative of global impacts, but most aspects of the creation account were centered on larger Mesopotamia in the Middle East. There is no biblical rule which states that every creation day must be perceived as global events, and I believe the primary renewal started where it ended, which was the region where God would plant His garden paradise, specifically along merging Euphrates and Tigris rivers in southern Mesopotamia. With the Bible we have a record of God focusing on specific works involving His people, oftentimes leaving out the rest of the world, which is precedence I must consider for these regional works. Having written that, the great warm shift in global climate change alone may constitute a new global beginning for much of the world and its diverse species, for those who interpret Genesis from that view. From a planet bombarded with cataclysmic catastrophes and extinctions to God raising the world out of death, darkness, and destruction, from sweeping flames and freezing torment to ideal climates, it is sensible to believe that most of what was alive saw God’s first renewal day as a new dawn on life. But again, God’s works are usually centered on His people and His redemptive purposes for them, speaking little of the rest of the world, and that is how I should present this renewal account. The pattern of Scripture is that God discloses His works for His people and rarely the rest of the world, unless His people (in this case being Adam and Eve) are specifically involved with them or their regions or later nations. Thus, the creation account has a global essence and impact, generally concerns the Middle East/Near East, but is specific to southern Mesopotamia. Beginning after the Younger Dryas, utilizing the impact hypothesis for an event before 12,000 years ago, we find that the first millennial day of Genesis (12,000-11,000 ka) perfectly parallels the time of change in meteorological and climatological conditions. Natural facts support that during the beginning of the millennium after the devastation of the Younger Dryas Impact, the glaciers receded very suddenly; the date that researchers from Copenhagen give for this sudden warming is 11,711 BP, which rests within this theory’s timeframe for the beginning of the renewed world between 12,000-11,000 ka. Scientists may conclude that many regions of the world came out of darkness even closer to 12,000 years ago, but it only concerns New Genesis Theory that it occurred within the millennial day asserted in the framework of Divine Scripture. Light was restored and then there was a rapid warming for a new world. “Let there be light,” said God, and global warming followed. It reasonable to conclude that the first millennial day in the brief Genesis summary accurately correlates with conditions on Earth during the time in question. Earth was dark after a cataclysmic event diminished many lifeforms, pushed many others into extinction, and left a void sheet of ice that blanketed much of the planet. But God said, “Let there be light,” and suddenly a new day dawned. Thus far, if the YDI hypothesis is correct, 1/6 of NGT correlates perfectly with the end of the Pleistocene. In the second millennial day of the renewal, 11,000-10,000 BP (9000-8000 BCE), with the continental glaciers continuing to melt, it is near-universally agreed that much of the world, specifically the northern hemisphere, was inundated by the melt waters. Evidence for the flooding has been found in multiple regions. These melting glaciers were no small chunks of ice but continent size, and apparently they began melting as suddenly as the freeze that swept over the millions of hapless animals and people. This glacial melting is thought to be the reason for the drastic rise in sea levels, especially inland seas and lakes. I heard somewhere, but I cannot recall where, that between 12,000-10,000 BP New Guinea was connected to Australia through the Carpentaria plain, and that peoples once crossed over before the rising oceans separated the continent. Accordingly, the aboriginal people have a flood myth called “Dream Time” that commemorates the great deluge of their ancients. I suppose that if we went back to witness the sudden global warming, we might find that many of the flood stories around the world witnessed to this period of time, whereas some might also witness to the great flood in the days of Noah. What strikes me about the flood myths is that they would not be recorded or retold had the catastrophes been too gradual for ancients to perceive in their daily lives. Hence, it is more probable that ocean waters covered the connecting plain rather quickly sometime after 12,000 ka. The Mediterranean Sea became a primary recipient of the glacial runoff from Europe- being partially landlocked- and overflowed into surrounding coastal regions- North Africa, the Near East, etc. According to some geologists, the Black Sea and Caspian Sea were once landlocked subsidiaries of great flooding. Even more astounding, the rising sea began filling the Persian Gulf region- a profound marine encroachment that covered much of the ancient paradise region that is today near sea level. The rivers Tigris, Euphrates, etc., also swelled over their banks, so that the area of Eden was covered with water at the beginning of the Holocene. In Scripture, the second millennium is when the “firmament” or expanse appeared out of a sea or ocean, with water above it (above sea level) and water below it (at sea level). This millennial day, showing God’s work with an ocean, forming this “expanse” called “Heaven” between the waters, fits with the scientific view of continental flooding and increased oceanic activity. From this past event, today’s oceans are hundreds of feet higher than what they once were, and flooded plains, especially low-lying southern Mesopotamia, would have seemed to rise-up out of the waters as they abated and emptied into the ocean basin. Thus, it is my opinion this expanse was in southern Mesopotamia, which reappeared as waters abated from regional flooding. The flooding may have abated as the four rivers overflowing in the once-dry Persian Gulf ripped through to join the rising ocean waters. Some Egyptologists and flood theorists claim that the cataclysmic water hieroglyphics at the Egyptian Temple of Edfu show this rebirth of the world after what the ancient Egyptians called the “First Occasion,” while others assert that it is the second flood of Noah that is depicted. Interestingly, the Revelation church assigned to the millennium and flood of Noah assures overcomers they would not be hurt of the :second death” (lake of fire), which may very well have dualistic interpretations- that is, if the flood of Noah was once considered the Second Flood Occasion. For the ancient Egyptians to call the great flood and resulting birth of civilization that they depicted a “First Occasion” implies that there was another great flood or a “Second Occasion,” such as Noah’s Ark. Because the temple has two construction periods with centuries between them, it is difficult to exact when they were written. If the second flood of Noah was already well-known, the first Middle-East and northeast Africa flooding would simply have been called the “First Occasion,” which wall encrustations of sea salt within the pyramids may indicate. Some legends, such as the flooding of Atlantis c. 11,300 years ago, seem to support this chaotic time of submerged islands and perhaps even continents of ancient civilizations. We simply do not know what exists deep beneath the icy poles, and we have only explored a small part of the ocean floor. After the apocalypse of the Younger Dryas, Earth suffered great floods and quickly rising sea levels that probably left some ancient civilizations (pre-12,000 years ago) covered by ocean as others inland regions recovered from glacial flooding. Thus, whether Atlantis consists solely of an ancient writer’s imagination or history, it fits within scientific conclusions of a millennium of great flooding and altered coastlines. The work that Lord was doing in the paradise region on the second millennial day involved bringing up the expanse and dividing the waters above and below it, which fits with a natural explanation of great floods from melting glaciers, which eventually dried up with remerging region. It is likely that most of Mesopotamia was for a time flooded as fresh waters of four great rivers overflowed their banks as they emptied into the rising Persian Gulf. Again the low-lying region is today at or near sea level, which means it was very susceptible to extreme flooding during the warming period. The particular “firmament” to divide the waters is very mysterious. Firmament- raquiyah or raqia– means expanse, and throughout Scripture it concerns the heavens. In some Scriptures raqia clearly suggests the troposphere, where birds fly in the midst of the firmament (not a solid expanse). However, in the most ancient sense, which Genesis is, the word implies more, meaning to spread out like an expanding region or plain (possibly solid). This word has multiple meanings, much as many words today have multiple definitions. The expanse could mean both the earth and skies of the paradise region. As will soon be explained, the heavenly expanse witnesses to multiple biblical themes, even as Genesis’s creation witnesses to more than one period of time. The expanse can be something built that separates waters like Noah’s Ark; atmosphere between the raining clouds and earth; be a roof; or even be a regional expanse or plain. In the geographical sense of paralleling Genesis to ancient events in the natural world, on the second millennial day of renewal, I perceive the heavenly expanse to be an expansive region- a form of Heaven on Earth. Babylon was considered the home of the gods in the Samarian religion, as well as a paradise or heavenly locale. And the “gods” dwelled in the heavens. For a brief recap, in the first day God’s Spirit was hovering (a term implying gentle reverberation) over dark ocean waters 12,000-11,000 BP, and the division of days and nights returned with atmospheric clearing and sunlight. In this millennium we see God bringing-up an expanse that divided the waters, leaving waters above (atop) and below. This expanse of Heavens on Earth arose out of the flooded region in preparation for the next millennial step in the Divine plan of creating a paradise. I think the heavenly expanse is meant to be mysterious within this millennium of renewal. The firmament being a region on Earth fits with the coming Kingdom of Heaven, which Messiah continuously explained was hidden in the earth. I have no doubt that the firmament mentioned in this millennial account is the garden region. As the Kingdom of Heaven is mysteriously explained in parables, but coming to Israel, this firmamental expanse’s formation has retained much mystery. The “Heaven” here should not be confused with “the heavens and the earth” of the first sentence of Genesis. The same word, shamayim, is in both passages, which is plural, but in the first verse heavens and Earth are already created, which we today call the universe. What we have with this expanse is something that God called “Heavens,” which was likened to heavens above. Relating an earthly “Heavens” to the “heavens” above has precedence via Paul relating “Jerusalem above” to earthly “Jerusalem below.” So there are patterns of things from above to below, the lesser after the greater. If the “sons of God” were called “stars” of the heavens then, of course, where they inhabited on Earth would be called the “Heavens.” This “Heavens” was made by dividing waters above and below, which suggests a regional expanse as God was fording waters away for them. The connection is that God created a garden wherein He later brought Adam to till the ground and tend- a heavenly paradise. Bible passages compel readers to consider the terms “Heaven” and “paradise” interchangeable, as believers have throughout Judeo-Christian history, so it should come as no surprise that the expansive “Heavens” that God was forming between waters was the beginning works for a garden paradise. The etymology of Eden suggests that the word was once indicative of works of irrigation. Though I could find no root in Hebrew, in Egyptian ed indicates mist or dew, as KJV translations renders a description of a “mist” that “went up from the earth and watered the whole face of the ground.” And we should not forget that Moses, who served as an Egyptian prince for about 40 years and wrote Genesis, probably incorporated the Egyptian word for a paradise region. The word ed clearly expresses water enveloping landscape. Perhaps of equal importance, the Akkadian edu has been associated with Eden and implies things such as flood, waves, swelling, inundation, and river overflows. The Akkadian edinu means a plain or steppe as a result of waters. Early forms of the word Eden were used frequently in Sumerian and later writings, revealing the word to mean a steppe and fertile plain, which our ancestors found desirous and pleasant for living, having irrigated the waters. From all these we gain insight into the Hebrew Gan Eden, which means a delightful garden. En toto, it becomes clear that fresh waters above and the salt waters below had once rendered the region’s locale beautiful and desirable, especially with irrigation projects accompanying agricultural development. Thus, this paradise plain or regional expanse was considered God’s “Heavens” on Earth- the focus of His early works in forming the Garden in Eden. This was the home of the “sons of God” who later reproduced with Adam’s progeny. In conclusion, the second millennial day of the Genesis summary parallels geographical conditions at the time in southern Mesopotamia, where an expanding plain was emerging from receding waters of glacial flooding. The separation of waters above and below an expanse suggests the receding occurred at a coastal region, with waters left above sea level (fresh waters on land) and below the expanse, or at sea level (salt waters). The clues granted are few, but what we gain from Scripture and ancient etymology, the expanse that God called “Heavens” was paradisiacal- the Garden of Eden being developed by water works over time. The low-lying Persian Gulf was likely flooded, and the marine encroachment of ring sea levels eventually reached inland to the city of Ur. What can be gained from the 2nd day is that Genesis Ch. One likely describes works relevant to the southern Euphrates and Eden of Genesis Ch. Two. God calling this expanse or plain between the waters “Heavens” may be a clue that paradise was the work He had in mind. The third millennial day of renewal, 10,000-9,000 BP (8000-7000 BCE), the Lord caused more earth that had formerly been flooded to dry in an unspecified location, relevant to southern Mesopotamia- obviously a much greater land mass than the expanse. Specific seas were separated from land but not created, and this we know because the Spirit hovered over the deep earlier in the first millennial day. Seas already existed, but this is a description of God drawing certain waters away from land. God’s work at the beginning of this day may have been routing rivers that would flow into “one place” called “Seas” for bringing about vegetation and forestry. And we should consider for this region that the Persian Gulf was filling for millenniums after the Younger Dryas. Thus, it is perceptible that God worked progressively from Day One to Day Three through nature. Prior to the Holocene, the Persian Gulf, which is a shallow sea, was a plain of land with a river flowing through it and out to the Indian Ocean, but the rising oceans inundated the region, which is about the size of the nation of Jordan. Several rivers also flowed from what is now Iraq and Iran to route the expatiation of waters. Thus, all the waters were being drawn together to one place that was rapidly filling, even while much of the earth was still drying from previous glacial flooding. Thus, it appears as if the initial heavenly expanse between waters was further developed with earth/water works of this millennial day. It may be that the garden area of paradise preceded other works of God in the region. The millennial days, of God beautifying paradise, correspond with the rest of Scriptures and scientific data specific to the region, although much of Earth’s forestry was renewed after the receding ice and flooding of the last glacial age. Remember that God “planted” a garden east in Eden for Adam and Eve, which is the main theme that the first chapter of Genesis develops. In Bibles today, we find chapter divisions between the creation account and the account of Adam and Eve in Eden, but the first scrolls had no division to separate the two accounts; the works in Chapter One lead directly to the home of Adam and Even in Chapter Two, which makes this exegesis perfectly sensible. The first chapter of Genesis should be as relevant to the lives and history of Adam and Eve in the garden as the Promised Land was to Israel, not merely an explosion of creative feats before the family tree of Adam and Eve became the main focus of Genesis. If we view Genesis as a whole- that God was preparing a paradise region for a new civilization- it makes perfect sense, and it fits the relevant data now available. Remember, too, that “earth” in Genesis does not necessarily mean the entire “planet,” but in Hebrew, similar to other languages, it can mean a region of the Earth, soil, or land. In other words, the “earth” that God brought forth fruit trees in concerns Him planting a garden. As we consider the proceeding works, the theme of God creating the paradise region in Chapter One makes perfect sense. Not only that, but it again fits with the scientific data and conclusions. In the millennial day theory, God separated earth from waters, 10,000-9,000 ka. 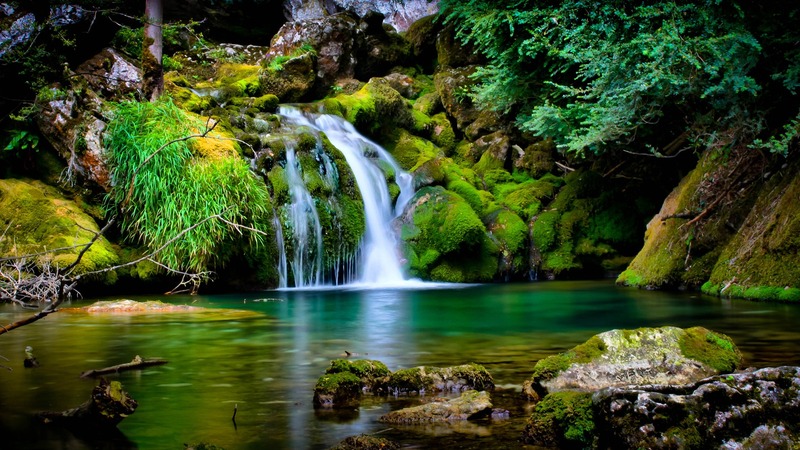 During this day He brought forth lush vegetation for paradise. During this time the entire region of paradise, as well as the Arabian and Saharan deserts, was very moist and completely covered with thick vegetation, which suggests that the earlier glacial flooding and increased rain assisted in this geographical flourishing. The Holocene Optimum, which began about 9,000 years ago, fits the Genesis timeframe of God bringing forth fruit trees and plush vegetation 10,000 to 9,000 years ago. It helps us perceive how a paradise like the Garden of Eden- once mocked by many science secularists because of today’s arid conditions- had existed in southern Mesopotamia. Why the initial expanse emerged before the dry ground of this millennium, I do not know, but it all seems to be connected with this regional fertilization and flourishing during the Holocene Optimum. Further (and skipping forward a bit), the end of the plush Holocene Optimum period c. 5,000 BP parallels the biblical timeframe in which the Lord cursed the region to become dry and toilsome earth, particularly as punishment for Adam’s historical disobedience. Here it is plainly perceived that Scriptures again perfectly parallel conclusions found by climatologists, Egyptologists, and others who provide research data for the region. Their conclusions of decreased rainfall at the end of the Holocene Optimum correlates to the Genesis description of the Lord causing it not to rain, with steady decline of paradise to toilsome soil after the adamic transgression. Without rain to sustain the vast flourishing, which was fed by centuries of floodwaters soaked deed into the ancient soils, where “a mist went up from the earth and watered the whole face of the ground,” eventually desert conditions would prevail. The enriched soil would exhaust its resource of moisture as evaporation increasingly carried paradise away. According to Scriptural genealogy, this curse would have occurred about 3900 BC (5,900 BP), which is confessed by an arid whether event in the Sahara desert c. 3900 BC, with a mass eastward migration of Africans to the wet, fertile Nile Valley of Egypt. Adam and Eve, created c. 4000 BC, were expelled from paradise during the curse of dry soil, and he and Eve had their third son Seth when Adam was 130 years old c. 3870 BC); but Cain and Able were already adults or adolescents before Seth was born, meaning at least 15-30 years of age. They were old enough to harvest and hunt and for one brother to kill the other while envying his accepted sacrifice. If they were 30, this places the regional curse, one as far away as northern Africa, at the same time of Adam and Eve’s trespass. The arid sweep that affected northern Africa affected the Middle East. Before that arid sweep, the Garden of Eden- where God “put the man whom He had formed”- was a migratory refuge from increasingly arid conditions, for Adam and the animals the Lord called to the region, at least until the mist and dew were exhausted and tilling the ground and land irrigation became the new way of life. Thus, if we momentarily set aside the powerful truth that God caused these things, and only consider the story of Adam and Eve from a historical perspective, we find that it perfectly fits known facts that have been patiently concluded by sincere geophysical scientists (i.e., not merely zealots of Darwinism). In conclusion, the third millennial day of flourishing land in Genesis fits perfectly with the beginning of the Holocene Optimum. Not only does the third day of God’s works fit, but the seventh day curse of Adam, when God said, “Cursed is the ground for your sake” (see Gen. 3:17), also corresponds to scientific data for the end of the plush period. Genesis reveals that God created the paradise region and God cursed it to harsh and toilsome earth. The facts stand on their own, whether we insist that God can control nature or posit that nature only acts on its own. Dry earth that emerged after the glacial flooding of the Mesolithic Era, along with the beginning and end of the Holocene Optimum paralleling the biblical account, should cause even staunch Bible skeptics to reconsider Genesis as a historical document scribed in the available language of Moses. On the 4th millennial day of renewal, 9,000-8,000 BP (7000-6000 BCE), God sent enlightened people to rule the ancient world of southern Mesopotamia- “home of the gods.” This fits with archaeological finds of the earliest civilizations in the region, from 9,000-8,000 years ago. One of these great luminaries, affectionately called the “Greater Light,” hints as the Sun of Righteousness, the awaited Messiah. The other was called the “Lesser Light,” which describes the Moon of Adversity- the Satan, who rules over dark sentences and reflects light as judgments on humanity for trespasses. These two, great luminaries or enlightened ones were placed by God in (or, interpretatively, sent into) the firmament of the heavens- the regional expanse between great waters. The heavens and the Earth were already created before the 4th millennial day. Also, God sent in His illuminating stars- messengers of righteousness. Thus, in this millennial day we can again logically perceive developmental works unfold, where the “sons of God” had a plush region to inhabit, which fits archaeological discoveries. They effectively prepared the way for Adam and Eve and the following city-state civilization of ancient Sumerians. Together these enlightened messengers were given for signs and knowledge of seasons and times- astronomy and mathematics- and their understanding apparently brought about the Agricultural Revolution (Neolithic Revolution) even before they settled in Mesopotamia. From the Book of Job, we know that they were with God as He set sand bars to stop encroaching waters before they inhabited the region (38:7-11). This departure from strictly literal to synonymous terms, with lights, luminaries, and stars, is a bit out-of-place, but the Lord has left biblical precedence of keeping names secret when He has reasons to do so (e.g., wrestling with Jacob). While I would like to explain New Genesis Theory in entirely naturalistic terms for the nonbelievers rather than employing symbolism, I understand why God chose to hide their actual names and substitute them with luminaries. For one, the symbolism better expresses the nature of their works than their names would. Hermeneutically, this departure to symbolism for the fourth millennial day invites criticism for the entire theory, but the rule-breaker here is God, not me. He does as He pleases and does not play by our rules. Later in the book, specifically concerning ATLAS Theory, we will further discern why God did this. That being written, I do not believe that God calling these entities “luminaries” and “stars” is as profound a departure from empiricism to symbolism as it first seems. It was common for names in Hebrew culture and many others to be given descriptively. In more recent time we have done the same, such as calling HaSatan the “Lucifer,” which means light-bearer. Native Americans have done likewise, with names such as Sitting Bull. Thus, comprehending who the “luminaries” of the 4th day were calls for readers to consider them within the context given. If a literalist claims that the days of creation consisted of 24-hours, but then asserts that the sun and moon were literally created on the 4th day to measure days and years, the prior three day’s literal measurements appear arbitrary. But if we consider ancient Hebrew culture and the fact that God often named and renamed His elect to depict truths, no anomaly exists in the context. In the New Covenant (Brit Chadasha), we see that God purposely related Genesis with the messianic Light, where John wrote that “In the beginning was the Word…In Him was life, and the life was the light of men. And the light shines in the darkness, and the darkness did not comprehend it.” (See John 1:1-5.) 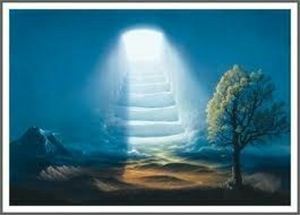 Here we perceive the Messiah’s arrival as a great Luminary of God’s Word. He walked in the garden and talked to Adam and Eve and ate with Abraham at his tent, and it is speculated He was King Melchizedek over Jerusalem, back when it was still “Salem.” So Messiah was without earthly mother or father until born of God’s Spirit through the matrix of womanhood. And these things mean that He was and has been a Teacher of Righteousness as the Light to the world even before us. The point is that the Lord has always been a Light to the world, even before being born Yeshua, although secretive with His name. It may be that God decided to send some of these enlightened ones to all corners of the ancient world. After the millennium that began the plush Holocene Optimum, we find evidences of grain cultivation and agriculturally-supplemented economies dating back to at least 9,000 BP (e.g., Yangtze and Yellow River basins, Melanesia, and the New Guinea Highlands). Likewise, around 7000 BCE (9000 BP), agriculture began to flourish again in Egypt, with more advanced cereals being domesticated than the wild-grain harvesting millennia prior. Animals were imported and wells were dug in Nabta Playa, and the entire region of the Cradle of Agricultural seems to have gained a great enlightenment. I do not think it is coincidence that God gave His “signs for seasons” and “luminaries” for the world at the same time as the Agricultural Revolution. It is amazing that God’s Word records Him planting or bringing-forth all kinds of vegetation- various kinds of fruit trees and agrarian food sources- from 10,000-9,000 BP, and then His luminaries to teach seasons, likely astronomy, and signs of the times from 9,000-8,000 BP, and that it so perfectly correlates with the beginning of the Holocene Optimum and peoples around the world beginning the cultivation of wild grains and harvests to supplement their ancient hunter/gatherer cultures. Again, we find that the third millennial day of Genesis brilliantly prepares for the Divine works on the fourth millennial day of the account. I simply do not know how the Word of God, with the millennial days set in their proper places, could better parallel archaeological and anthropological (and so many other disciplines’) conclusions. The six millennial days of Genesis provide real highlights of God’s progressive development of the ancient world. Wherever else His luminaries may have been sent c. 9000 ka, we can only speculate, but signs suggest they brought about enlightenment on a global scale, for a new age of humanity. The “stars” of Scripture instructed Neolithic peoples like those of Jarmo who settled in the Mesopotamian region around 7000 BCE (9,000 BP) and Samarra of Mesopotamia c. 6000 BCE (8,000 BP). The symbolism in Genesis suggests that they taught righteousness, with Divine judgment, and the seasons of agriculture. Again, the archaeological finds support these civilizations emerging within the same timeframe and region of the Lord sending out his great luminaries to the region of His renewal. The people of this period were taught agricultural living so that they would prosper in their new civilizations of plush vegetation and growth. It is almost as if aliens had landed to instruct ancient peoples during this time, but these aliens from the heavens were the luminaries of God. Whether they were born on Earth or came from above, their arrival coincides with a millennium of great enlightenment. 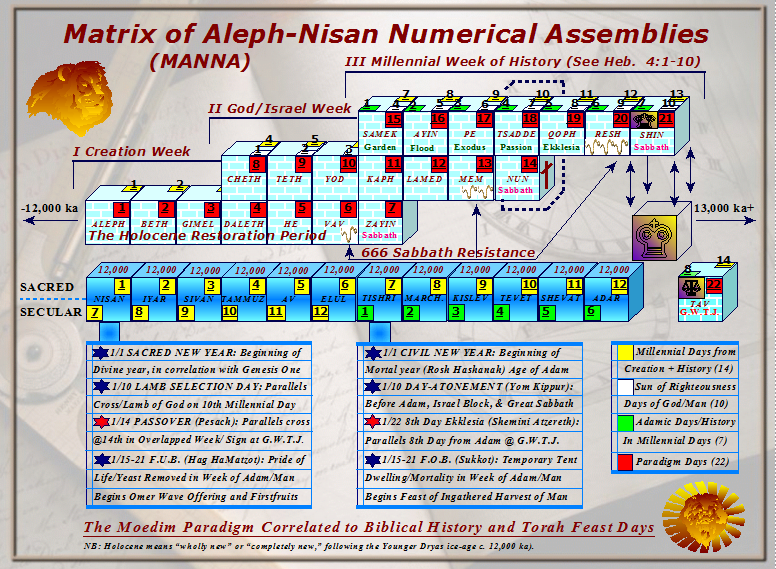 Who exactly were these luminaries sent to early Sumerians on the 4th millennial day of the renewal sequence, 9,000-8,000 BP? While I can only speculate about things that God has not specifically told me, some people propose that perhaps the Egyptian harvesters of wild grains, who lived 12,500-12,000 BP, migrated up the Mediterranean coast as a result of the Younger Dryas catastrophes and began teaching a new agricultural way of life in the northern regions. Perhaps they had helped supplement hunter/gatherer communities of less-advanced peoples of southeastern Turkey. Possibly, from 9,000-8,000 ka they split and some made their way down the Euphrates River. Though the “sons of God” who preceded Adam and Eve are subject to speculation, as for their region of origin, biblical symbolism can direct us to the nature of their enlightening works. The Gospel of Life of these messengers of God likely foreshadowed a spiritual harvest of Judeo-Christianity, only theirs’ seems to be of literal seasons. The word “made” here has wide implications in Scripture and does not necessitate an absolute beginning of these luminaries. It can be used when telling of someone who “made” a feast or was “made” the governor. In the same way, it can be read “God appointed two great luminaries; the greater Light to rule the day, and the lesser luminary to rule the night.” All interpretations depend to some degree on the interpreters knowing what the Lord is actually explaining. The brilliance of God is that one passage often allows for multiple interpretations. In the ancient Hebrew culture all aspects of nature served as symbols for intellectual truths, and everything that was “made” or “appointed” came from an infinite God. Precedence for identifying God’s children with the stars of heaven is given in Scripture, not simply by my interpretation. Joseph dreamed of his father, mother, and he and his brothers to be sun, moon, and twelve stars (cf. Gen. 37:9-10). (For his mother this only meant that she reflected the judgments of his father, not that she was associated with Satan.) Even more interesting, Joseph’s paralleling vision was of them as harvesters binding sheaves in the field (cf. Gen. 37:6-9). So both dreams of spiritual symbolism express that Joseph would rule over them. Thus, the precedence for relating the luminaries with harvest seasons or agriculture is biblical, as well as stars and luminaries ruling over peoples. From the above passage, we find that the “morning stars” were on Earth as the Lord was renewing the world, and they seem to have helped and celebrated His works as they observed. The dawning stars rejoiced when God appointed the Cornerstone of His works, whom is the Christ. Here, the Lord describes a darkened sky and seas which “burst forth” or flooded before He set the boundaries on them by sand bars, determining how they would go in and out in tides. Hidden within His wording is the fact that His renewal was preplanned, with measurable foundations, and that Christ would be the Cornerstone of those measurements. Darkened skies, flooding, the sons of God praising, and Divine measurements based on the “Cornerstone” indicates that these “stars” witnessed God’s renewal works in the Genesis. Couple this with the fact that Messiah is later called the “Sun of Righteousness” and it becomes clear who the luminaries of the 4th day of Genesis are, rather than what they were. Why word these things so poetically? The wording challenges our modern minds in how we decipher information, since they are dualistic revelations which we are not accustomed to. They express higher ideas rather than archaic ignorance. The picturesque wording makes parallels between the world being renewed after a flood and a great house being built, which is measured, has its foundations, has a cornerstone, has bars, and has doors. It is perceivable that the sons of God, who lived on Earth, had an understanding of a house or temple being built through ages of time, and that it began after a great flood and time of darkness. Thus, two different things are described, but they are purposely connected. Notice that the rejected Cornerstone during our accomplishments is connected with time- the “day that the LORD has made.” Thus, there are measurements of time connected with the Christ, just as temples and houses were often measured from their cornerstones (cf. Matt. 42; Mark 12:10; Luke 20:17; Acts 4:11). However, perceiving this is contrary to how we conceptualize information today. The people said, “Tell us plainly if You are the Messiah,” but they could not hear when He told them that He is the Cornerstone, just as Bible-believers today can read the passage from Job and not solidly conclude that the Cornerstone rejoiced over by the morning stars means that Christ was on Earth with luminaries during the Genesis account. And if He was on Earth with the stars, where else in the beginning is He revealed except as the Greater Luminary? And if He is the Greater Light that was sent to enlighten children of the Day with signs and seasons and days and years, what can this mean except God has set times for on things that we should reason over? When the passages are compared, it becomes clear that the stars and luminaries had spiritual knowledge of the redemptive works of God in Christ. It can be reasoned that all the crosses set for the rising sun and the Southern Cross at Gobekli Tepe c. 11,700 ka also witnesses to Him- a righteous man girded at the loins above the creatures of the world. At the time, the Gobekli people were learning signs, seasons, days, and years- being brought out of darkness. When the Lord brings is entitled the Sun of Righteousness because revelation and understating shine like light, but Satan the moon is put under the feet of His people at Zion (see Rev. 12:1). There are many theories which seek to explain the transition from nomadic hunters to agricultural communities of the Fertile Crescent c. 7000 BCE. They include, but are not strictly limited to, (1) Oasis Theory, (2) Demographics Theory, (3) Evolutionary/Intentionality Theory, and (4) the Feasting Model. Proponents of a Middle East “Cradle of Agriculture” generally agree that such changes were a cultural revolution. Although the exact beginning of the agrarian revolution is not agreed upon, many theorists apparently agree with the timeframe I give for God bringing forth plush vegetation. Indeed, He sent forth luminaries to teach seasons- 8000-6000 BCE (10,000-8,000 BP). Cultivators needed to know the right seasons for planting; they needed to know the times. They had to have a beginning of this knowledge. Moses, via Genesis, was clearly speaking of more than the literal heavenly luminaries to “rule over” days and nights (see Deut. 4:19). Moses could have directed readers to a literal “sun” or “moon,” but God worded the Genesis account in this way to conceal truths until the appointed time. Moses wrote of “greater luminary” and “lesser luminary,” and “the stars” to express the “sons of God” giving light of understanding to a dark world of ignorance. Oftentimes in Scripture lights denote people, angelic beings, and Divine understanding rather than the heavenly bodies. If the region was considered Heaven on Earth, those who came to it and gave Divine knowledge would have been considered luminaries. Moses, whose strictly forbade nature worship, did not mean that the actual sun and moon would rule over the world and be worshiped, but that God would send leaders or children of God to enlighten the ancient peoples. Israel, as a latter example, were an agricultural people whom God instructed in their harvests, their appointed times, and called “stars.” God told His people that He “teaches you to profit” and “leads you by the way you should go” (see Isa. 48:17). In conclusion, the world did not happen upon a great revolution in comprehension of times and seasons, but God sent His stars to teach them the signs of the times to their profit. For Christian readers who have problems considering these things, questions may arise: ‘If Messiah and His heavenly messengers or “sons of God” walked among these pre-Adam peoples, why were their societies not perfected? Why did it take so long before God began something new in Adam and Eve?’ For this we must look to biblical precedence. Have the children of Israel- the Hebrews- been perfected? Heavenly messengers have guided Hebrews with specific instructions since Abraham around 4,000 years ago, and even the Messiah walked among them. What about Christians? 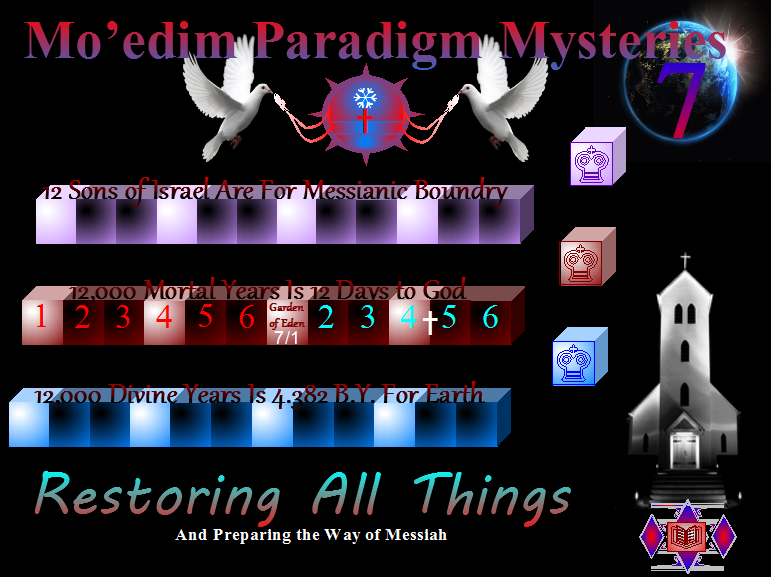 For almost 2,000 years we have also had the teachings of the Messiah and Divine appearances, and have we yet obtained perfection or a return to paradise? God’s ways and times are different than our own. He is eternal and He does His works according to His infinite and wise will. Believers should resist thinking of times before our own as instantaneous events of God’s will, but as history, and in the way we see God unfold His works throughout our history. What we perceive are the developmental works of God- Him working at a pace appropriate for humanity. The wording of the Genesis summary of creation is so brief that it, along with the word “day,” compels readers to consider the passages in one brief workweek, which is a perception that is difficult to suppress without the rest of the Scripture being kept in mind. Doing so can be likened to summarizing world history from the Hittite Empire to our own day in a single paragraph, if it neglected to provide specific dates along the way or helpful clues to enlighten us to the fact that much was left out. Yet if we were to study complimentary sources of world history, the brief summary would no longer lead to misconceptions. Likewise, the works in Genesis are simply highlights in a sequence of six millenniums. For creationists who insist that these luminaries of the 4th day were literally sun, moon, and stars being created, a problem arises, which has been emphasized so many times by others that I loathe even bringing it up. Nevertheless, I must do so for those who are new to these exegetical arguments: God said before all things that He created the heavens and the earth, in the very first sentence of Genesis. If we subtract the sun, moon, and stars then not much remains for the heavens. In fact, one must reason that the heavens were an unfinished work until the 4th day. Logic and the perceivable methodology of God dictates that the heavens and Earth were created before the latter summary of works, completed long before the specified events of the fourth day. If Scripture calls the people with God before Adam “stars,” and this concerning the renewal of creation as was clearly disclosed to Job, it may be logically deduced that the stars of the fourth millennial day actually refer to them. We cannot reasonably say that it only appeared as if the sun and other lights were created on the 4th day, with clouds blocking them, if people were not there for an appearance of them being created. It makes more sense that the luminaries were entities bringing light. The second major problem with an unyielding, literal interpretation of the firmament of the 4th day is that stars were placed in the expanse of heaven, but the waters were divided above and below it. If not an earthly expanse, this would imply that the expanse is somehow the star-filled universe wrapped in water, and our comparatively microscopic planetary oceans are counted as the waters below. This makes no sense. For these universal waters to be divided into two for the starry expanse to appear between them, the universe would have to be emerged in water before the divide. Yet if we understand the firmament of Heaven as a location of paradise, with the birds flying in the open expanse “of Heaven,” no such controversy exists. Waters can be above and below an earthly expanse called “Heaven,” but a watery bubble or dome around the starry universe or Earth lacks any sort of empirical support. The idea of the starry expanse separating waters above and below it is so illogical that I cannot grasp the proper words to explain and rebut it. Indeed, we know who stars of Scripture are; who the Sun of Righteousness is; and who only appears as a light as he orbits to and from things of the world, distorting the waters of the Word like the tides of the oceans. To conclude the fourth millennial day of Genesis, it makes perfect sense that God would send an enlightened people and even the Sun of Righteousness to southern Mesopotamia to teach the early settlements, which soon led to the first great city-state civilization following Adam and Eve. This fits the archaeological record of emerging civilizations and their great innovations within the region and timeframe, with all the new agricultural, cultural, and astronomical developments. On the 5th millennial day of renewal, 8,000-7,000 BP (6000-5000 BCE), the Lord filled “waters,” perhaps the sea which He had previously drawn to one place, with abundant life, even as He will fill the Dead Sea with life when the Messiah returns to restore paradise (see Ezek. 47:7-12). Currently the Dead Sea bordering Israel (or Salt Sea) is the only sea in the world without life. It is the lowest place on Earth, at almost 1400 ft. below sea level, filled with salt mounds. But God will transform its salty waters during the Sabbath millennium. Filling a sea with abundant life is a portent of Divine restoration. The idea that the Lord will bring life to the Dead Sea after the Apocalypse suggests that the Genesis account need not refer to all oceans or seas. In fact, Genesis referred to waters being gathered to “one place” or region. Filling the Dead Sea with life after the Apocalypse provides more support for a cyclical pattern of the Lord renewing regions for His chosen people. Concerning water for marine life and southern Mesopotamia, a case can be made for the encroaching waters of the Persian Gulf providing another source of food for the region, but there are other interesting emergences of marine life that occurred during this timeframe. These concern the Black Sea and the Caspian Sea. Geologists and researchers have concluded that the Black Sea once consisted of fresh waters that were flooded by Mediterranean salt waters during this period, around 7500 BP. The Black Sea was once a lower-level freshwater lake, and the conversion from fresh water to salt killed marine life within it until the inundation was complete. Although fossil dating estimates leave a 640-year window between fresh water to salt water life (7,460-6,820 ka), new marine life indeed began to fill the new saltwater seas during God’s works on the fifth millennial day. Although God does not specify which sea or seas He filled with life during this timeframe, all three make for tenable candidates, within the regional proximity and allotted time. Possibly the Genesis passage speaks of the encroaching waters that had reached inland as far as the city Ur, and that these waters are the ones that the Lord specifically spoke of, but it is not my purpose to assert an absolute for which sea or seas. My only intent is to show that Genesis easily fits every millennial day concerning southern Mesopotamian and its surrounding regions. The research of Kennett and Kennett goes into much more detail concerning the Persian Gulf- the shallowest of great seas- being filled by the rising ocean after the Younger Dryas, from Early Holocene through the Middle Holocene at the time of Adam. The marine transgression, as they explain, reached as far as Ur by 4000 BC. Kennett and Kennett, citing other sources, give the most notable rises in sea level at the Arabo-Persian Gulf approximately 12,000-11,500 years ago, and again from 9,500-8,500 ka. Thus, God filling unnamed sea or seas with abundant life may be related to the Persian Gulf, from late Pliocene unto the age of Adam, or it may refer to the Black Sea. Readers can reach their own conclusions via the data available today. The waters reaching to Ur and other southern Mesopotamian cities by 3500 BC reveal that the Garden of Eden, 500 years prior, was probably very close to the sea. We can understand that Adam was given husbandry over animals with evidences of animal domestication within the time and region, but note that God also told Adam to have “dominion over the sea.” This suggests that Adam lived near the sea. I believe that Adam and his immediate descendants could only “subdue” sealife if they were near it, and if some were fishermen. Prior to the Younger Dryas, as the great scientists referenced above have explained in detail, the Persian Gulf was a habitable region with a great river running through it and out to the Indian Ocean; yet it was filled over the millenniums in question all the way up to the city of Ur, in the biblical region of the Garden of Eden. I can only suppose that God did this as another work to bring forth paradise. The Sumerian state-civilization emerged less than 500 years after Adam was brought into paradise. It was here that they irrigated the land and became proficient in agriculture, animal domestication, and marine life. A reasonable conclusion is that such great accomplishments did not immediately appear, but Adam and his relatives played an essential role in establishing that which so soon after changed the world. According to Scripture, long-living Adam was still alive when the first great cities were built. Considering Adam’s time and place, he was likely a pioneer of our new world-age of city-state civilizations. From the ancients’ perspective, he and his wife may have gained so much forbidden knowledge that they became god-like, which led to the arid curse of the region with lack of rain and troublesome ground. Rather than the modern presumption that Adam and Eve were ignorant because of their innocence before God, we should consider how people of their own time may have perceived them becoming like gods after eating of forbidden knowledge. While we can hardly call Adam and Eve ancient scientists, they were indeed enlightened. They appear to be the pinnacle of the works of God and his “stars” in educating humanity. This scenario can be compared to Europeans landing and settling in the “new world” of the Americas. Although the continents were already scarcely populated with thriving tribes of paleo-Americans, the growth of city-state civilization that the Europeans brought since discovering the lands in 1492 is phenomenal. I imagine that the “sons of God” caused a similar effect on southern Mesopotamian communities and culture, and with the works of Adam the thriving cultures flourished into a city-state civilization that we might recognize today as one like our own. Their loss of personal paradise was indeed the beginning of a world that celebrated science and achievements. If we look past the injustices done to the indigenous peoples of the Western hemisphere, we find that the ancient peoples were enlightened with the world’s knowledge in less than a millennium. Knowledge was both a blessing and a curse to those who first lived on the rich land of an American paradise. Indeed it is quite easy to look back romantically on paleo-American cultures, but the truth is that many of the tribes were as cruel and ruthless as any community of European barbarians, and nature mysticism shrouded peoples in darkness. There were rapes in tribal warfare, scalping, beheadings, slaughtering of innocents, religious sacrifices of human beings, and many such practices that confess that the harmonious existence often portrayed of all tribes by today’s educators consists almost entirely of historical revisionism and selective history. Brutality in tribal warfare for lands, herds, mating, and resources existed centuries before Europeans entered the fray. Perhaps for many native Americans, surrendering their current lifestyles of casinos and humble reservations for a return to a freer age of hunting buffalo and other herds would indeed be a dream coming true, but for many others the world that exists now would prove better, offering opportunities and knowledge that would otherwise not be, perhaps with greater justice. Just before Adam’s time, the Lord commanded abundant fowl to fly over this earthly frontier, to multiply in the region. It is not written that sealife and avian life were nonexistent in the ancient world; these are the presumptions that Genesis allows readers to make. As the shallow waters of the gulf transgressed inland, birds would have naturally increased in the region to seize upon easy oceanic prey. It is no coincidence that God first filled unnamed waters with abundant life and immediately had birds flying in the expanse of Heaven; the former led to latter developments, as is the Genesis pattern. Thus, if bird migration is a distinctive part of the regional ecosystem now, we can rightly conclude that it was even more so during paradise. Regionally, birds flew above waters filled with sealife. It is clear that the birds flew across an expanse of land, and that the “firmament” mentioned in the passage is not a place far above us where stars shine. Birds were associated with southern Mesopotamian people because the region houses a wide variety of exotic fowl which were drawn to it by the Lord’s works. Even until recent times “the marshes teemed with life, serving as one of the world’s most important stopovers for migratory birds,” as written by Erica Gies in the NYT, April, 2013. For the fifth millennial day of Genesis, we again find that a regional exegesis of the works correlates with facts now known via archaeological and scientific discoveries. Even with etymological changes of Hebrew and translations of the Genesis account over millenniums, we yet perceive the Text comprehensible as a streamlined, historical account of God’s works for the six millenniums leading to the Adamic Enlightenment. Scriptures do not grant readers an account of all proto-historic communities, and it is not meant to, but it does provide a historical silhouette for Christ’s line, which today’s research does much to fill. On the 6th millennial day of renewal, 7,000-6,000 years ago (5000-4000 BCE), God gathered all kinds of animals, which He had created from the earth, to the paradise garden to be named. This is where Adam comes in, whom God breathed His Spirit into at the end of the 6th day, to be like Him and the children of God with Him. What does this mean in natural terms? At the end of the Holocene Optimum rainfall decreased and the formerly lush vegetation in regions of the Middle East waned, particularly in Saudi Arabia. With that decline came a great deal of wildlife that migrated to greener and wetter lands. The Garden of Eden with its four rivers drew migrating animals during this time. Cuneiform scripts reveal the large variety of animal migrations and domestication in the Persian Gulf region. Southern Mesopotamia was one of the last refuges of a vast area of land rapidly losing its plush vegetation to arid conditions, so the influx of animals supports the biblical account. With abundance of newly arriving and previously unknown animals came a need for providing them names, for domestication and latter local trade. This was apparently the task of the biblical Adam, the man brought into paradise prior to the great city-state civilization of Sumerians. The primacy of Adam’s historical place cannot be fully appreciated without considering the work God appointed him (see Gen. 2:19-20). Naming things in ancestral times implied dominion over that which was named, as perceived via prophetic names that were often granted to children by their parents, seemingly setting their courses in life. Without naming things there are no words or speeches or writings. Adam naming all the creatures made him a sort-of father to all God’s creatures. This was revealed to Adam in Genesis; he was given dominion over the birds of the air; the fish of the sea; and all animals of the terrain. To the modern mind this seems menial, but to a dark world of nature mysticism, with so much left to discover, and myths of ignorance to overcome, it meant a sense of control over ferocious beasts that had frightening natures. Naming things meant the blossoming and spread of knowledge to communities- where people began to name everything and compare all things in creation, no longer remaining captives of ignorance. Without Adam and the language he brought forth for the first cuneiform tablets, this book could not be written nor a record of God’s works be delivered to us. Without such a humble beginning we would not have the literatim needed for our faith today. He was given this light of understanding. The light of life comes by the Word of God, and that light of literacy first shined on Adam. This does not mean that surrounding peoples did not have names for the animals they were familiar with, but that Adam collectively began naming all of them. To be fair to Adam, no evidence exists for a uniform system of writing before His time and region. I do not believe the world was virtually silent before Adam, but I trust by God’s Word that the work Adam did was unique and divinely-inspired to bring literary light to the ancient world; the extent of his influence is left open to debate. Although Adam’s beginning predates the earliest cuneiform tablets recovered by about 600 years, it is possible that earlier ones will someday be found, closer to 4000 BC. But, according to Scripture, Adam’s long life in the region coincides with the earliest record of Sumerian language- of, indeed, all written language. The earliest cuneiform tablets that we do have only come to us because they were accidentally fired as cities were burned-down during raging warfare, which of course also fits the Genesis description of violence covering the ancient world before the flood. But critical scholars would likely agree that the tablets found did not appear immediately on the scene without an earlier formation of the language. It would have done little good writing on tablets if the symbols and a way of reading them were not previously known. Someone had to name things and write them all down, and he had to have the trust of the region that God appointed him to such a task so that others would participate. To help evolutionists comprehend, just picture an ancestral Darwin-like man and his garden region as a Galapagos island of animal curiosity. Picture a nature-loving man studying and naming the creatures. Picture a region abundantly filled with exotic animals and diverse wildlife. With so many creatures, he had to assign symbols to memorize what he called them, but he was not so lucky to have pen and paper- only clay and reed. With the abundance of pictures and his naming things came the earliest rudiments of ancestral literature, which assisted in trade information for seals and containments. The Lord gave him the light of inspiration to do this. Thus Adam, unlike Darwin, transcended the known world of the time and was created in the image of God, given the Word. It is my belief that the Messiah walked in the garden and taught him. Adam had a light that would shine in the darkness of ignorance, given by the Word of God. I am not implying Adam was Christ- the Word of God– but that he was made like Him and given the light of understanding in a dark world. The Messiah brought the New Covenant Word, but the first works of the Lord in His Word were through Adam. He became a light for his age, and his work was bringing the most ancient written words into the world. The duty that God gave him in the garden was not trivial and menial; the work of Adam was of much greater significance than people have perceived or given him credit for. It changed our world. With written words came an exchange of ideas that could live and excel beyond the losses of mortal lives. The written word anchored all ideas and unified humanity through time for mutual trust of culture and civilization. Thus, Christ is also called the Alpha (Aleph) and Omega- or the first to last letter- because He first taught ancient man, enlightening Adam and in turn enlightening us. From such eventually came paleo-Hebrew or the Phoenician script, and from there the truths of God blossomed with His written Word. Thus, the Word that was once inscribed with a reed by a stylus was the original source of understanding that quickly spread knowledge and led to our modern world. Without that light, given by the Messiah, mankind might still be drawing stick-figures in a cave somewhere in pagan Europe. Our minds would probably be filled with mystical darkness and confusion. Just as the Spirit was breathed into ruddy clay- Adam- for the enlightenment of humanity, it was soon inscribed on clay to share that enlightenment. And before all this, God first wrote in each of us- the dust, clay, earth- the Divine language of life that we perceive in the genetic code. Today we know that life is built on communicated information, but there is a much greater life that comes with our trust in the Word of God. So words take trust, and Adam trusted until the day he disobeyed and fell from God’s grace and glory. When he stopped obeying the Word of God, he fell from his perfection. Because Adam caused the fall of God’s perfect work, which was done through ages of time, all who came after him would be tested by God’s Word in a like age of time. Adam is at the root of that testing. 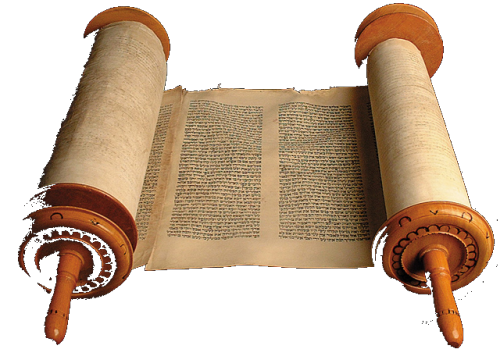 God hid certain knowledge from Adam and his wife Eve, but through disobedience they found it out; thus, through Adam the times of God were hidden from us so that by faith, we, his descendants of knowledge and spirit, would be tested by the knowledge we gain in the Word of God. Six millenniums would be tested for faith in God’s Word. Every man and woman who seeks to have higher knowledge, and disbelieves God’s Word in doing so, will also be cast out as God’s Word is shown perfect and His faithful people perfected. In other words, Adam and Eve fell via distrust for God’s Word, but we are made perfect and in the image of God by trusting His Word and Divine light; what Adam lost through his rejection of God’s Word, choosing his own understanding, we gain by faithfully following the Word. Adam, through disobedience, hindered 6,000 years of God’s work in the Genesis renewal process, although God created a perfect paradise region for him and his wife to dwell. Therefore, a timespan of 6,000 years has been given for humankind to work and be tested on our trust in His Word. Until the end thereof, the spirit of Satan is not restrained from destroying our works in a catastrophic fashion, at least until the Messiah again brings back peace and paradise in the Great Sabbath. Justice must be upheld by the Living God, for Adam did not restrain Satan but chose for evil to rule the human world which God worked for righteousness. This is why God’s workweek of millenniums was to be remembered, and we, the descendants of Adam and Eve, are to be tested by faith in His Word. I do not know if these things are yet allowed to be discerned, but Adam forsook God for a feeding serpent, and when mirrored to us, many people will forsake the Word of God for a devouring dragon. At the close of the sixth millennial day, God took from Adam’s ribs, his flesh, and designed a woman perfect and “comparable to him”- the crown of God’s new creations as his mate. According to Scripture, the Great Physician caused a “deep sleep” to fall over Adam, took his rib, and then “closed up the flesh” thereof. This phrasing should make people think of anesthesia, surgical closing, and some form of cloning. Eve was made completely new as per the wording, but she came from Adam, bone of his bone and flesh of his flesh, so not absolutely new. What is evident is that God did not speak her into existence, but obviously carried out some sort of medical procedure. For some this special event may suggest that God wanted a genetic equal for Adam, seeing that other woman lived in the age, but knowing how God foreshadows His great truths in biblical history, I suggest there were higher, spiritual reasons. The mysterious creation of Eve corresponds to the “Bride” of New Jerusalem being formed from Christ’s sacrificial sleep from the cross, for in biblical terminology “sleep” is often substituted for “death.” Adam had first completed his work of naming creatures before receiving his bride, which causes spiritual minds to consider Christ giving the Word before saying “It is finished.” Thus it is important that Adam’s bride was taken from his own sleeping body, even as a Body of Christ consists of members formed out of His sacrificial sleep- “hidden in Christ in God.” The people of the “second Adam” are made from His likeness and conformed to His spiritual image and share in His coming Sabbath paradise. The works of God in Eve have always been a mystery, even as the Ekklesia is also called a “mystery,” although it is now disclosed for those who will hear (cf. Eph. 5:25-33). In other words, if God planned on Adam to foreshadow Christ, and His Sabbath to foreshadow the millennium of the Messiah, it makes sense that Eve also foreshadows those who are formed out of the sacrifice of Christ- the Bride or Body. The life of Eve may also suggest that some who are called to be the Bride of the Second Adam will not heed God’s Word, but choose their own ways and knowledge of good and evil. The Second Adam does not trespass but restores the fruits of eternal life, and the new Eve will follow Him in trust of God’s Word. Not all the virgins will answer the call to the Bridegroom in time- not having the light of understanding- but those who do will be the Jerusalem Bride that Christ recognizes as the new Eve. For those who still insist that the days of creation were literal ones, a problem arises with Adam and Eve. Both of them were created on the 6th day, along with the animals that were brought to Adam for naming. If this was a 24-hour-period during a global creation, Adam had much work to do on the very day he was created, since all the animals created earlier on that 6th day had to be brought before him and named, and this before he decided he needed a mate, took his nap, and gained Eve as a companion. Do those who insist upon literal days really suppose that mortal Adam, on his creation-day, pondered upon what he would name all the creatures, and this before he gained his birthday wish with Eve. And Eve came after the Divine operation on the 6th literal day? Could so much work fit within a 24-hour timeframe before God’s crown of creation was given to Adam as a wife? Must we conclude such? May we never perceive the Creator’s greater days? Was Adam literally created within the same 24-hour-day as Eve but first had to name a long line of creatures brought before him on that sixth day? Should Bible-believers not reason over this? Would a little antagonism help some Bible-believers perceive God’s longer days? If so, we can continue our fun with Adam, for he would have necessarily been some kind of superman from day one of his life, flashing through thousands upon thousands of animals and giving them names at the blink of an eye. He would had to of been much more proficient at his creation-day works than poor Noah (cf. Gen. 7:4-10); God called some of all the animals to Noah, and it took him seven days to gather them into an ark the length of a city block with three floors, and this he did without pondering on what he might name them. And Noah had seven people helping him do the appointed works. Adam must have been moving like greased lightning on ice skates to name tens of thousands of animals in less than a 24-hour-period, even working overtime under moonlight. No wonder the amazing man Adam needed a deep sleep- a nap would never do! He was throwing-out syllables and laying hands on passing animals faster than Pentecostals speaking in tongues at a Holy Ghost revival! He was slain in the spirit to offer his awesome confession of sounds! Joshua must have appeared to make the sun stand still on his creation-day sky! Perhaps that does fit the nature of man: He can be pinning names on animals faster than Democrats passing-out protest signs, and spinning faster at it than Republicans playing Pin the tails on the donkey, and still he could have his mind on needing his woman. Perhaps the literal days do support natural facts and we should consider it settled! Certainly Adam could have been created after all the other animals on the same sixth day, named them, and realize that he was getting lonely before the stroke of midnight, or perhaps before 6 pm for a 12-hour Hebrew day. And sense we are so stuck on “evening and morning,” we might as well call it a 12-hour-day and increase the entertainment! And if we made a movie out of it, we could surely reduce the action time to less than two hours! On day two of his life, all the creature that he had met and named the day before would of course be remembered, for, although he had slept deeply since then, he was a superman to retain them all in his mind. But the question remains, why would he name all those animals in one day in the garden of paradise if his offspring would not live there to see many of those same animals and retain their names throughout time? Would he not have to take a little time and write them down? This all makes little sense via a literal framework, but perfect since if perceived as an actual period of history. We need not wonder why God was in such a rush to get all this done, for He was not. Adam both named the animals over a period of time and wrote their names down. I think I have adequately made my point on this: If I should not be ridiculous or dismissively silly with the things of God, why should serious, intelligent Christians and believing Jews so tightly hold to literal days, knowing that it does not make good sense to do so? It is one thing to claim that God was moving so quickly in the rush of creation, although it is not His historical pattern, but needing to drag Adam alongside in the ride to perform in the same speedy manner- on the day of his creation- diminishes the possibility of the works being done in literal days. This appears to be a blind spot, so I will simplify it once again: Land mammals were made on the sixth day; Adam was made on the sixth day; Adam named all the animals on the sixth day; Adam is lonely for a mate on the sixth day; Adam falls into a deep sleep on the sixth day; and God creates Eve from Adam on the sixth day. With God all things are possible, but I do not believe all things are possible with mortals; we indeed have limitations of how much work we can perform in a certain period of time. It is silly to think that this work was within a literal day, especially during the very day he was created. We have no just reason to believe in this, for Moses, David, and Peter compared 1 day of God to 1,000 years. And Job clearly alluded to much longer Divine days without specifying, while Paul stated that the appointed times of feasts and Sabbaths are a shadow of greater things to come, so why should we not look upon them as such? If Adam had decided on a name for each animal every 20 seconds, in twelve hours he could have named 2,160 creatures- if on the 6th day God created Him quite early rather than after all the other creatures. If he was only appointed to name 5,000 animals, he could not have done so in 24 hours, at least not if he took a few moments to reflect on them or took the time to write them down. And if we factor in a few meals and a couple breaks during this assembly line workday, the number of animals named would of course have been even less. These simple things make it perfectly clear that six literal days do not fit the biblical record. We can rush God in the creation to make His days equal ours, but rushing Adam- a mortal- to do his entire work on the first day of his life is unreasonable. With the literal interpretation of creation days, there appears to be two accounts, as many Bible critics regularly postulate in their dismissals of Scripture’s Divine inspiration. In the first account of Chapter One, Adam and Eve are both created on the 6th day and placed in paradise as God rests on the Sabbath from all His works. In the second of Chapter Two, it appears as if man was created before plants and animals, then God grew a garden and placed him there. Animals were then brought up from the ground by God, and after the man named them all he later received a wife. Bible critics have seized on this apparent contradiction, which without understanding God’s greater days is indeed valid, at least as far as it concerns the creation of Eve. However, if we understand that Adam lived at the end of the sixth millennium of the renewal and most of his years in the millennial Sabbath era, such timing poses no problem for providing literal interpretations of the sequence of events. At the close of the sixth millennium, God brought Adam into a garden region that had been prepared for him, and he began naming all the animals which the Lord had previously created from the ground and that had migrated to the inviting region. Within a short time of naming the animals, probably less than a year, he considered that he, too, needed a companion. Thus, Eve was specially created on the same millennial day, and then God rested in His millennial Sabbath. None of this implies that other peoples did not exist before them or at the same time, but only that the Lord worked specifically with Adam and Eve for a perfect creation. It really is that simple, and I believe God inspired the entire account to be written the way it was so that a time would come when people would rationally realize that the days of creation had to be much longer than they appear with a superficial reading. “I sped away in my car to work. I was so tired of working in the backyard that I had fallen asleep. I must have been driving way over the speed limit, for my boss had warned me about being late again a few days ago. That’s how I explained it to my wife this morning, and now I must be off to work,” John explained to his friend yesterday before he finally hung-up the phone. The curse sounds devastating, but it was not so much so that Adam and Eve and their descendants failed to survive. In fact, the opposite is true; they lived long lives and the region was developed in all the ways we might expect from people created in the image of God. If we perceive a world that received little rain for a long time, we find the answers as to why Africans flocked to the Nile River; why the Indus Valley blossomed with life; and why the banks of the Euphrates ballooned into a city-state society. Rivers and irrigation for agriculture was the new way of life, and it meant working together and learning new skills and trade. We can imagine a cookie-cutter man being pulled up from ancient ground and lifted to paradise by the hand of God, if we choose, but it is entirely possible that God placed Adam along the southern Euphrates by calling his spirit, leading him to the fruitful place. God could have carried Israelites through the air from Egypt to the “land flowing with milk and honey,” and skipped difficult decades of wilderness dwelling, but instead they were led by His Spirit and endured refining. Despite the difficulties, or likely because of them, Israelites went on to accomplish amazing feats in a barbaric land of walled cities- some built on the mortar of infanticide and other human sacrifices- and thus our world today benefits from their ancient toils, especially by the Divine Word and a monotheistic religion that calls us to justice and righteous, via His graceful Spirit. Often when there is a curse for our human rebellions, there is a blessing in waiting, by a God who makes all things turn to good for those who love Him and are called according to His purposes. So for Adam paradise was lost and he had to toil in the cursed earth, but just as he was placed in the garden, he was put outside the garden to be a blessing of enlightenment for a world that was being prepared for a new and better age. So both male and female were created in the image of God, with all that being human beings entail. But Eve was created in the image of God through Adam- an intermediate. This does not imply that she was less than an equal, not “comparable to him,” but only that she was a sign of us being conformed back to the perfect image of God through Christ, who serves as a spiritual intermediate for His people (see Rom. 8:29). In conclusion, the 6th millennial day of Genesis supports a period in which many animals migrated to the waters and vegetation of southern Mesopotamia, as surrounding regions like Saudi Arabia became arid and inhospitable. Adam began naming them for his offspring, which fits the historical record of the first written language- of southern Mesopotamia that correlates to his lifetime. It is common for skeptics in our generation to mock the biblical record of Adam and Eve, and lightly dismiss the entire book as fantasies equivalent to creation myths of other cultures, but for those of us who know better, we find that all six days recorded within the first book only strengthen the legitimacy of the grandest and most famous beliefs in the long history of the world. Readers are left with the liberty to decide for themselves if this theory provides “proof” or “evidences” of the historical accuracy of the Bible. But even for those who cannot be persuaded by the parallels to believe in God’s guidance, if they are of logical, reasonable minds, they can admit to their selves that it is fitting. Yes, fitting in deeds. On the 7th millennial day, 6,000-5,000 BP (4000-3000 BCE), God rested from His works in His earthly paradise- His Sabbath garden. We know that this was God via the Messiah, who “rested and was refreshed,” because God the Spirit does not tire (yaga). The Spirit is greater than the universe, but the creative Arm of God is Messiah. God was not alone in His works; the luminaries were with Him. As the Lord said, “My Father works and I work,” for the Spirit descended upon Him. The Spirit hovered over the waters, but Messiah walked in the garden. And on the 7th day He rested and was refreshed, granting us a sign of our following days. Mankind was soon after expelled from the Sabbath, but still the Sun of Righteousness shines upon us, illuminating us with righteousness. It does not seem necessary to summarize all the accomplishments of civilizations during the 4th millennium BC or how they parallel Scripture; they are too numerous and not included in the workdays of the creation renewal. Biblical history picks-up after the creation account and may be compared with secular history elsewhere. As for the Sabbath in Eden, other articles revisit it to affirm the Great Sabbath to come. It can be perceived from the Bible that this renewal was a regional work for a period of time, not an absolutely new creation, at least not in this account. The reason for peculiar interpolations after “create” in the passage is because translational words such as create cannot do justice to the primitive meaning of the Hebrew bara. The word often understood as a new creation actually means to cut-out, as if dividing something from its larger whole, like a piece of cake or a wedge of wood. The idea is that something is separated for works of perfection, which is why there is so much dividing in the Genesis account. Bara can describe a scoop of dust from a larger pile of dust or even suggest a period of time divided from a longer age- to restore or perfect something. Thus, ancient Hebrew allows for more than one interpretation, which, as we shall see, is the beauty of Genesis in revealing several historical frameworks. The creation account here is a wedge of history cut-out of a much longer history of the world. Bara carries the meaning of being selected or chosen out of something already there. It suggests renewal and a wedge of works in the specific region where God established paradise. Created things do not necessitate absolute newness, but here implies a separation for new works (refurbishing, restoring, recreating, etc.). Closer inspection of the primitive word clearly supports God renewing things that already existed, and them being done in generations or a span of history rather than in literal days of 24 hours. Let me give a couple examples for what the Hebrew word for create -bara- means in its primitive usage. Compare these two sentences: 1) God created every living bird on the 5th day; and 2) God separated birds for nourishing from every living bird on the 5th day. Each was created after its kind. The original sense of the word was not necessarily of absolutely new things, but a selection of birds for a renewal, divided from whole flocks of birds. All the birds God selected were after, or came after, their kind. Since God said that He created the world in six days, it can also mean that He selected a section of time to do a restorative work- the six days He mentions. How can this be? When God selects something from the whole for Himself and His work, it is also made new. He makes all His things new, as He sees it. It would be like me saying that I “made a table” after I actually selected a broken-down table from a group of broken tables and then perfectly restored it. Such is how the Hebrew word for “create” originally implied “recreate” in comparative English terms. For example: God uses the word bara when describing the restoration of his people and Jerusalem (cf. Is. 65:18); they were not created absolutely new, but chosen for restoration. They came after their kind of people. The city of Jerusalem would be restored, and the created people would come from people that lived before them. As mentioned, bara holds the sense of nourishment or food. In this sense, we are able to understand how a sword that cuts can be described as a nourishing loaf of bread (cf. Judg. 7:13-14). For one group of people it was a curse, but for the other, divided from Gentiles, it was a blessing- known as subjective reasoning of good and evil. As one secular humanist reasoned, to a little girl a wildflower was beautifully created from above, but to her father the farmer it was a cursed weed hindering his works. The creation account can be perceived as something cut-out of a greater history of the world to nourish the chosen children of God. The entire account is like the division of a sword, separating selected children and sustaining them while temporarily leaving the larger whole of humanity out of His objective descriptions. We can take the view that preferential treatment was somehow unjust, like the farmer killing wildflowers while tending his garden, but the Father has greater goals in mind. When the Sword (or Word) comes out of the mouth of Messiah in Revelation, it shows that His words will divide people, some to inherit the blessings of His restoration and disbelievers to inherit the curses that they bring upon themselves for their hatred for God. The Word given to seven millennial assemblies would divide His selected people from others and feed them, creating a new people from the whole of the seven millennial days. For this reason the Genesis account can be localized to the region of the garden and the children of God. Again, although there are many global implications, most of it concerns the work of the new civilization’s birthplace. Read Genesis with this understanding and it may be properly comprehended as a regional restoration. The sword of Scripture is thus subjected to our perceptions, meaning a good defense of those gathered unto the Lord for paradise and an offense to those who reject His Word for their own impoverished collections of knowledge. Indeed, Scripture is a double-edged weapon for protection of one group and the vengeance of God on those who resist His objectives. The sword of God prevented Adam and Eve from returning when they were separated from paradise, although the Lord was not finished with them. They were sent out into the world rather than being separated from the world. The second Hebrew word for “make” or “made” in Genesis is asah, which carries a wide range of meaning, evident throughout Scripture. It may mean restore, refurbish, remake, etc. This truth is not as contested and warrants no further explanation. Both Hebrew words are supported by Scripture to imply recreation and renewal. They can mean creation of things absolutely new, or they can allude to recreation of old things. So in Genesis where we read that God “made” this or “created” that, we can safely interpret the words as remade or recreated or renewed, each after its kind that already existed, at least for New Genesis Theory. If we have learned anything by Scripture, it is that God is a restoring and recycling God, in seasons and life and even works of history. We can call this a “new moon” and that a “new year,” but consistent cycles are what we perceive. Again, He makes all things new in its time, as written in Proverbs. Genesis has much more to offer, as readers will soon perceive; it ripples out other timely confessions of geo-history. In the next Genesis theory, I will cover the creation account from an entirely different perspective- a prophetic one (hence, Prophetic Genesis Theory). And, thus, another piece of the panoramic puzzle will be restored. Then, in ATLAS Theory of Creation, we will consider how 12,000 Divine Years, which we are given in the measurement of mortal years before the coming Kingdom, looks back to over 4.3 billion years ago, when God began works on Earth.